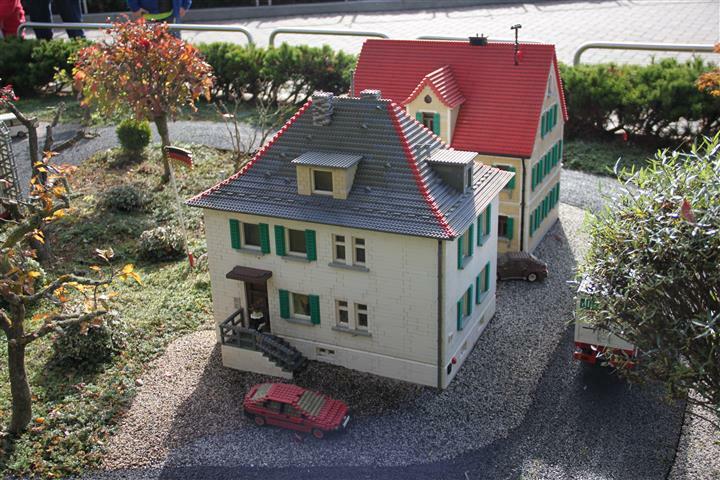 This archive post finds us back at our hotel in Ichenhausen, southern Germany. 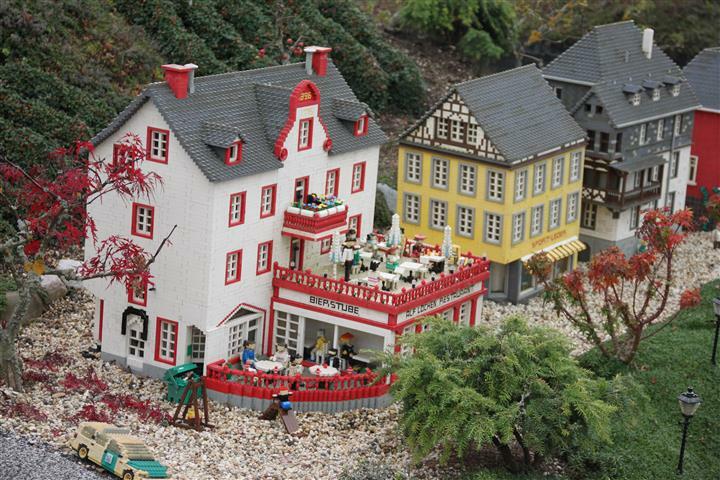 Our frequent visits to Legoland Deutschland, some sixteen kilometres away has been keeping us busy and so it’s been excellent to collapse at the hotel most evenings and just take dinner in their restaurant. 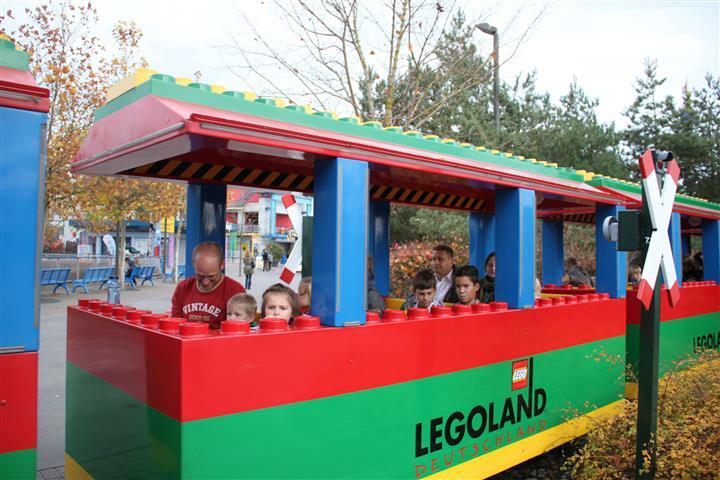 Breakfasts were taken there too and we were pleased because on the whole we found meals in the Legoland park to be rather underwhelming. 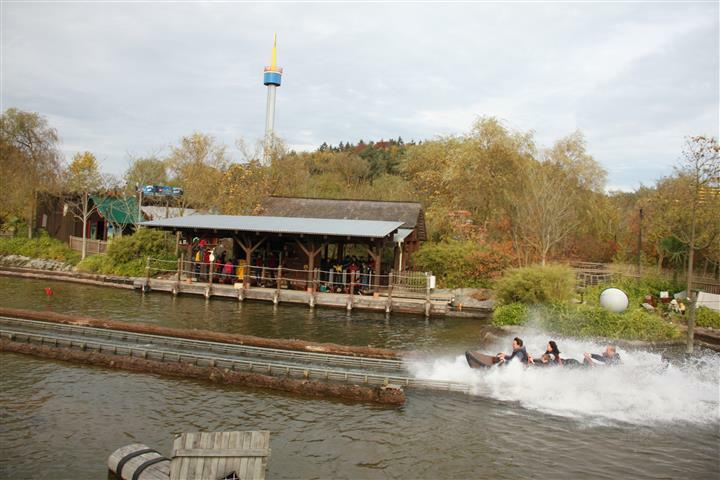 (maybe that’s also the risk of coming in the last week of the season). 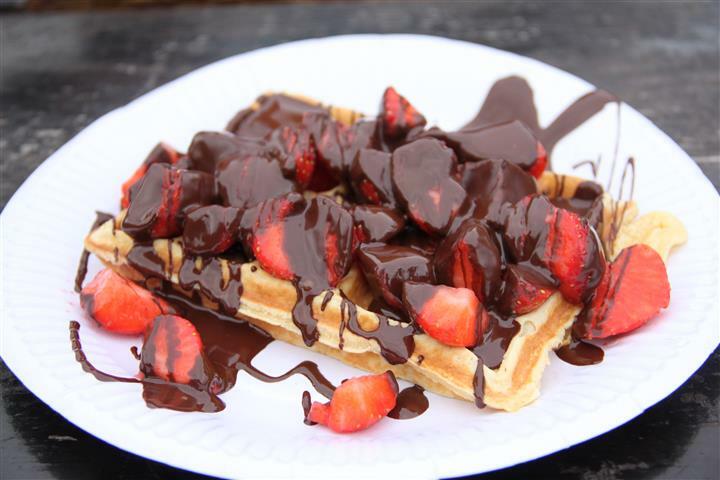 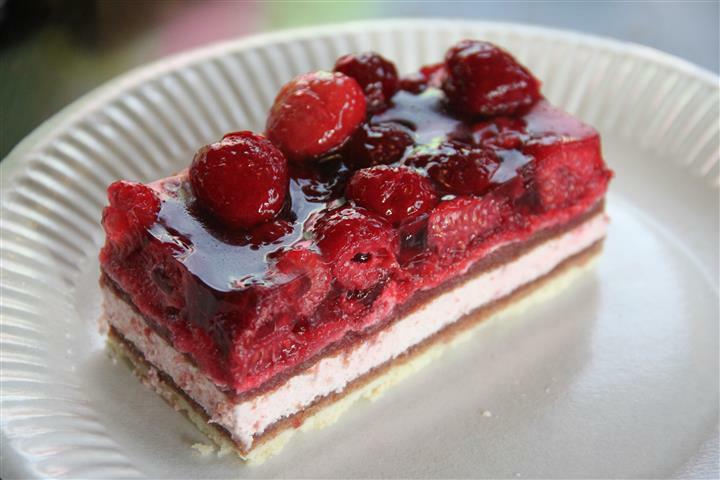 Legoland did however serve up two exceptions and they were both desserts: the first a mixed berry slice, delicious, and second: waffles with strawberries and chocolate sauce, or plain with cream and ice-cream. 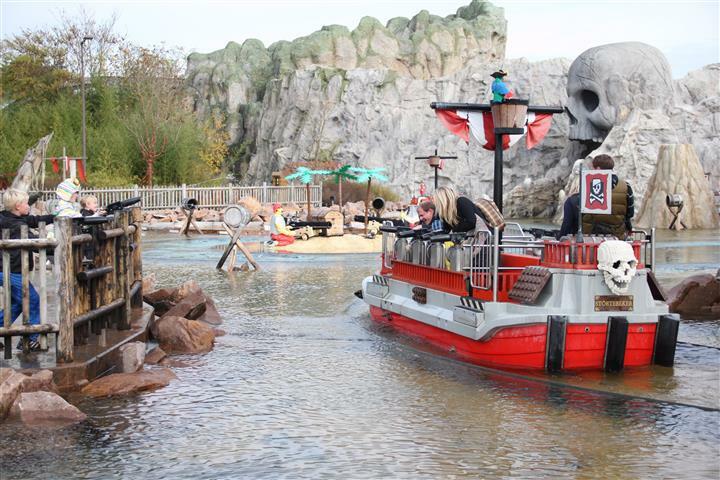 We should have taken the hint when we saw the enormous queue, tucked in the Pirate section of the park, seats around it were also limited, so when one came free, Little Mr, Kiwi Daughter and I took a seat to save ourselves a sitting place whilst Himself joined the queue to order the food. 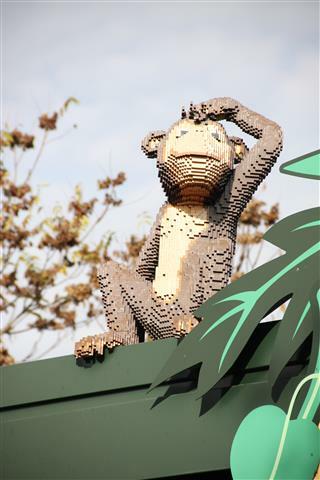 You think we would have learned by now, Himself asked who wanted a waffle and only Little Mr and I did. 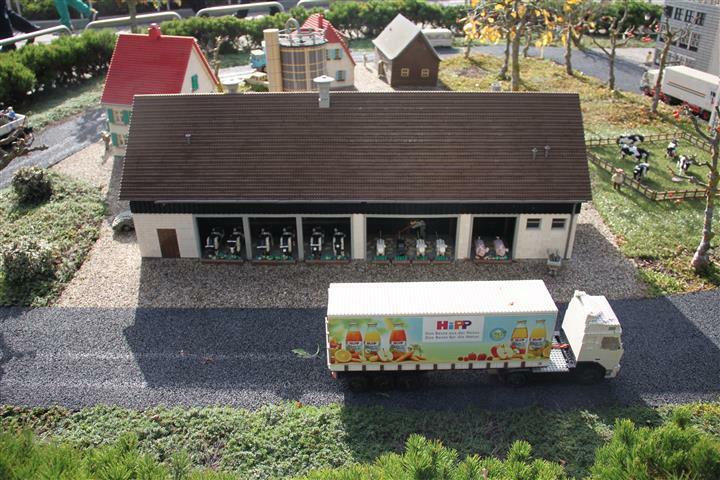 Kiwi Daughter was adamant that she wasn’t hungry. 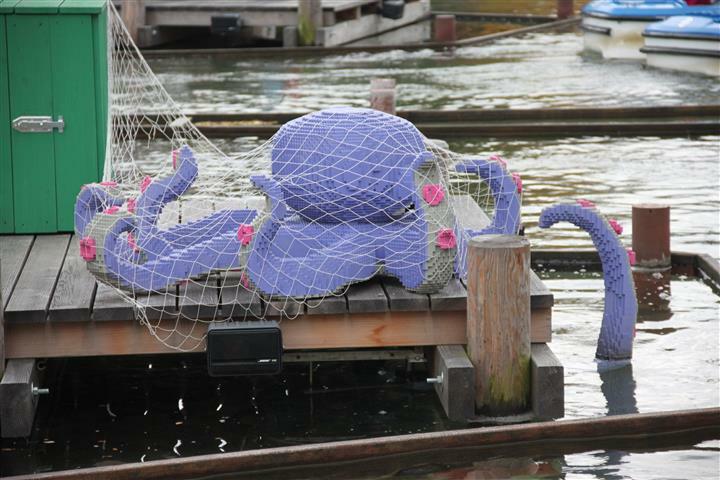 We made sure to ask her more than once. 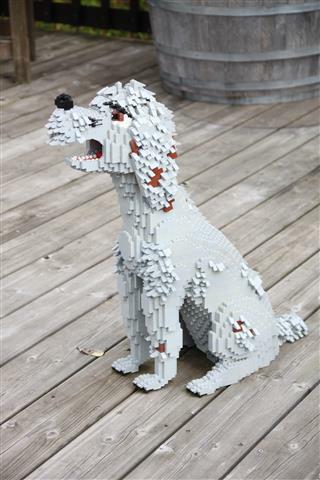 She got annoyed at the repetition and insisted that she didn’t want one. 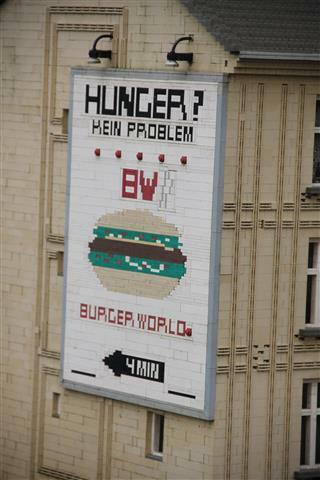 Stupidly we listened to her and only ordered two portions. 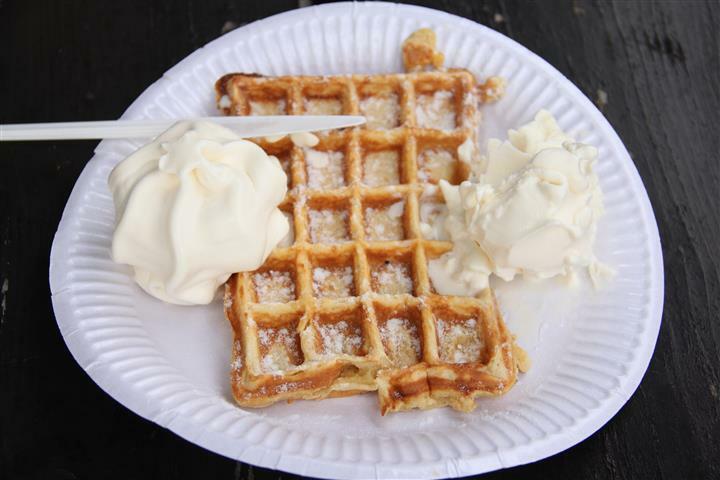 Needless to say, after a very long wait in the queue, when my waffle arrived Kiwi Daughter moved in like a hawk and picked up my fork. 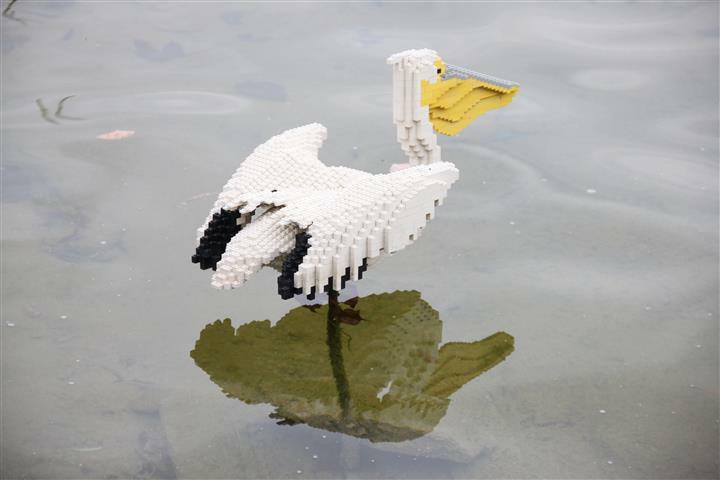 I intercepted that one quickly and reminded her that she’d insisted that she didn’t want to order one, so then began the typical kid attempt at using every trick in the book to get what she wanted. 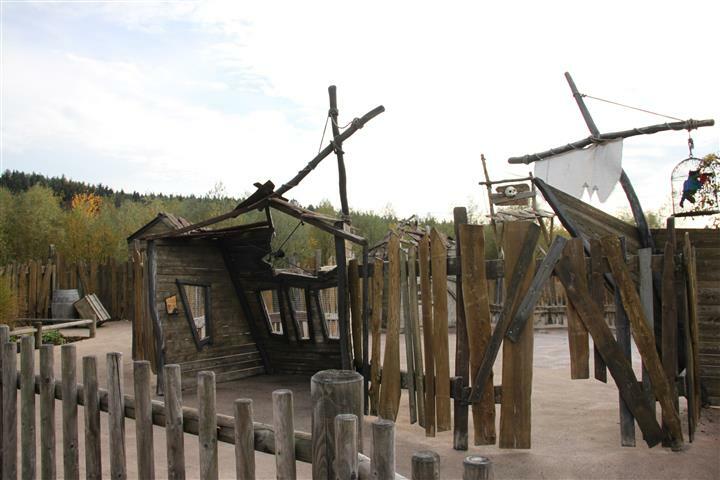 This game involves a no-holds-bared approach on the part of the kid: wheedling, cajoling and when that didn’t work, everything from cunning, tantrums and cute. 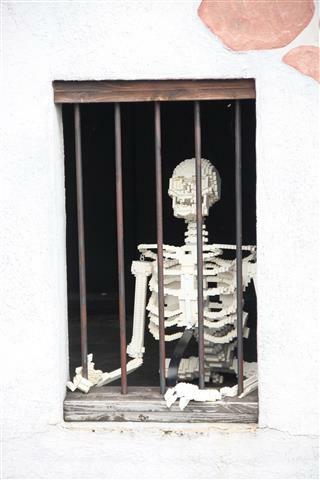 In the end (sigh) I just wanted enough peace and quiet to sit and enjoy what I had been looking forward to eat so caved in told her I would share. 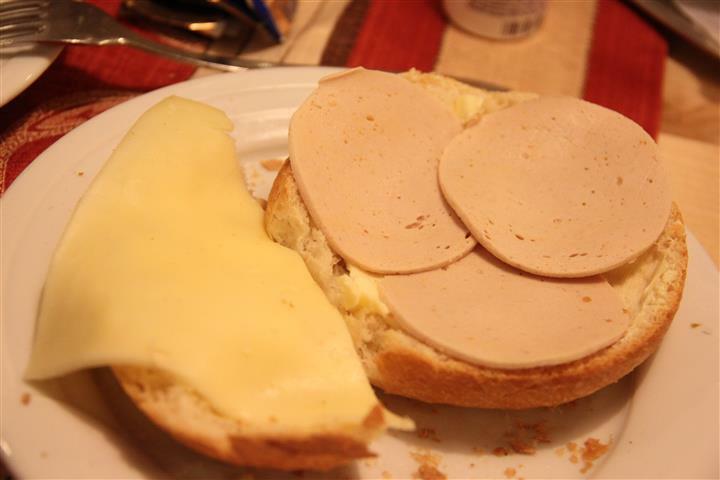 Kiwi Daughter actually had the gall to complain that she would rather have it all to herself, but enough was enough, then I really put my foot down and told her off for that, telling her in no uncertain terms that one more word of descent and ingratitude and she would not even get her first bite. 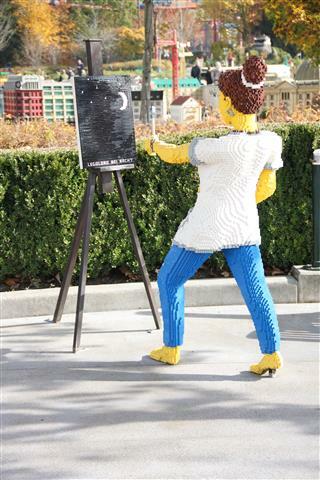 She was finally sensible enough to get the message and quickly changed her attitude. 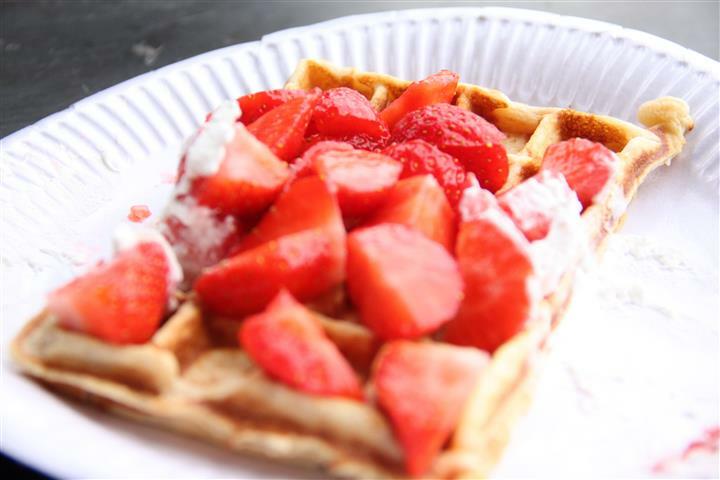 It ended up being a two edged sword because the waffle was delicious and I wished I’d had all of mine after all. 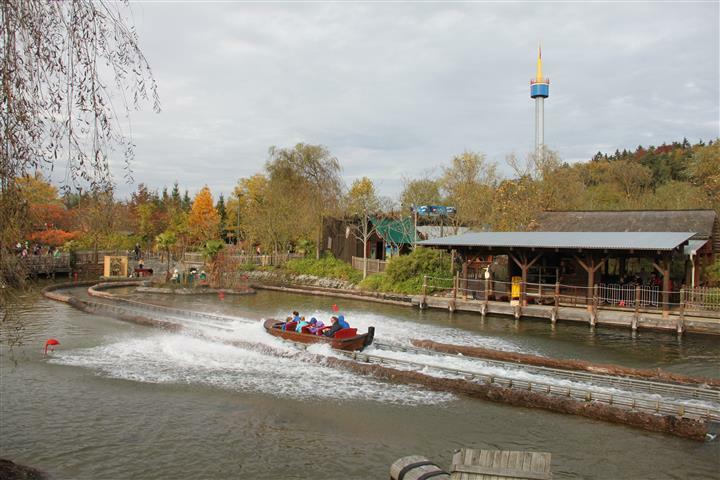 Kiwi Daughter’s earlier drama at the table had left us little appetite to endure the long wait again for a second helping or for Himself to face the still long queue of people that we wistfully passed by as we left this area. 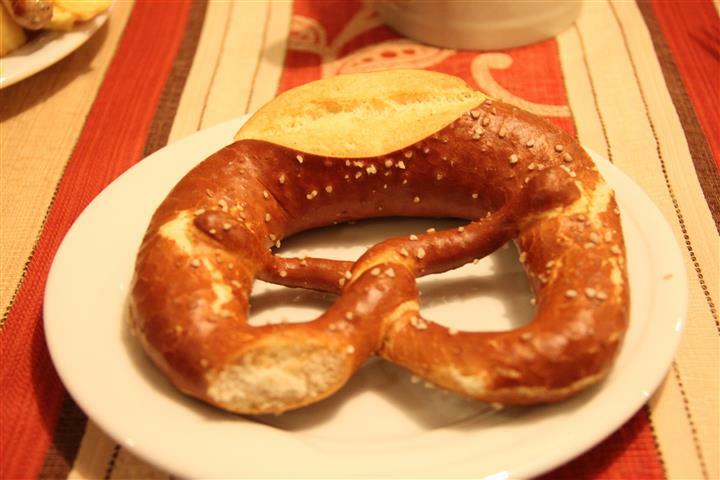 At least back at the hotel there were no queues at the breakfast tables and everyone enjoyed the pretzels and other delicious items on offer. 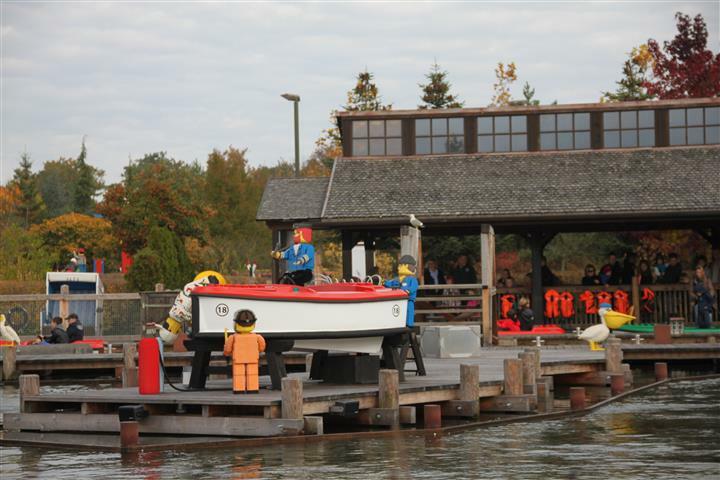 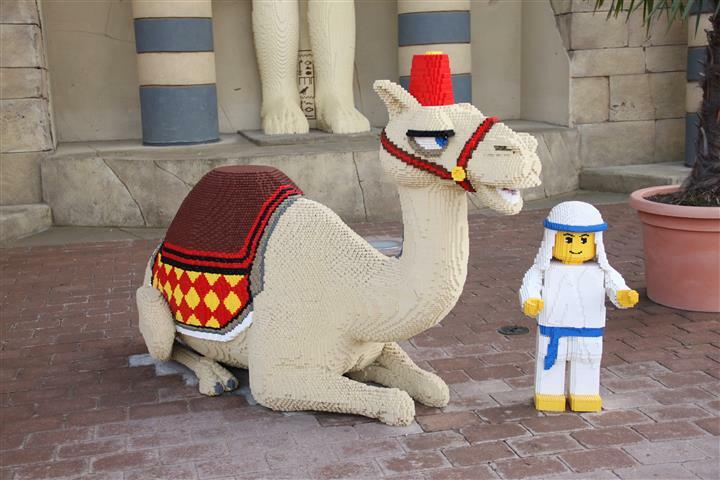 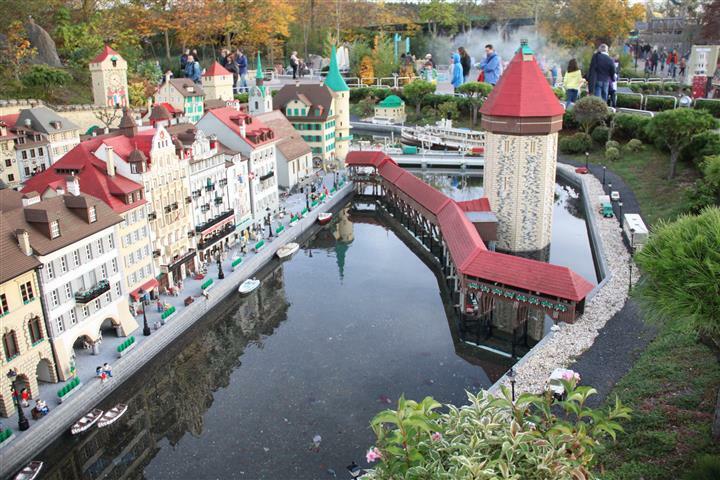 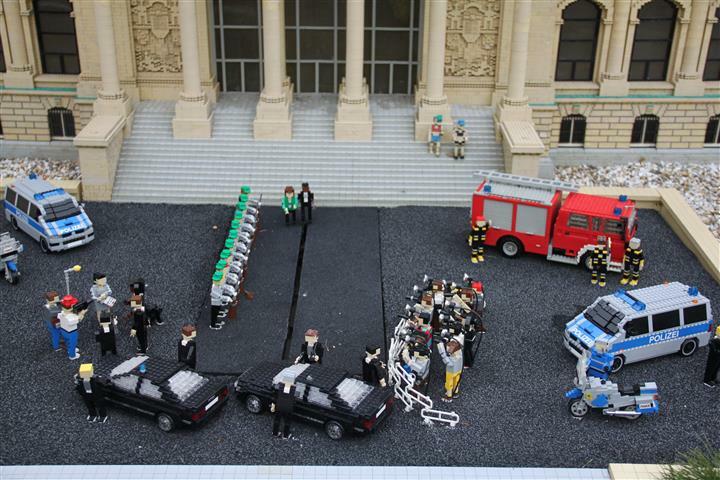 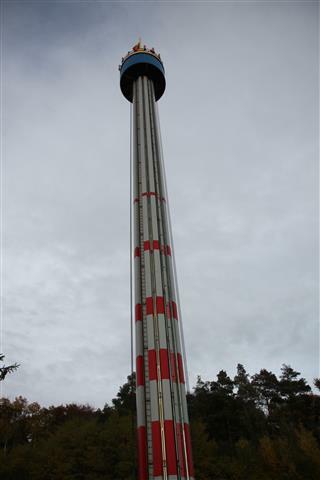 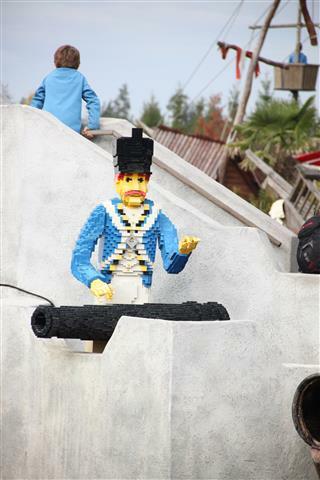 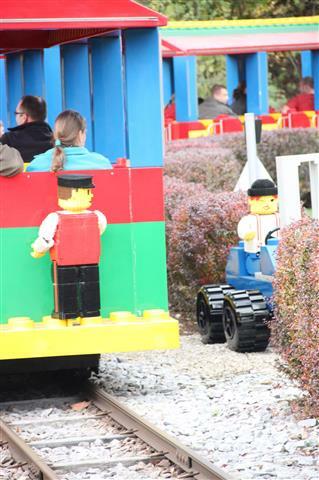 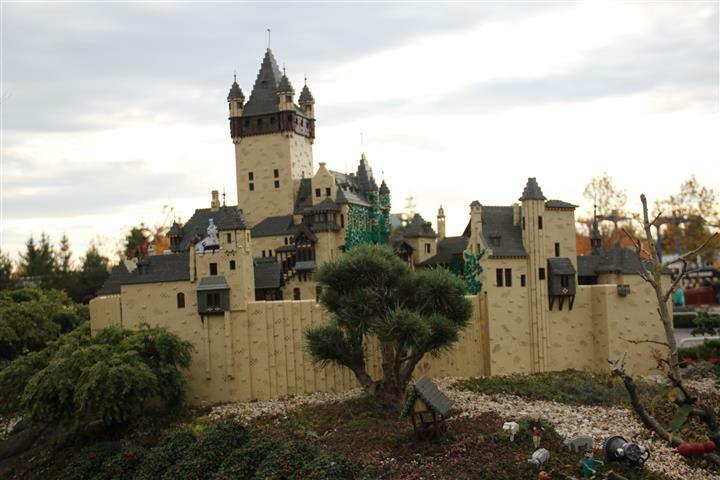 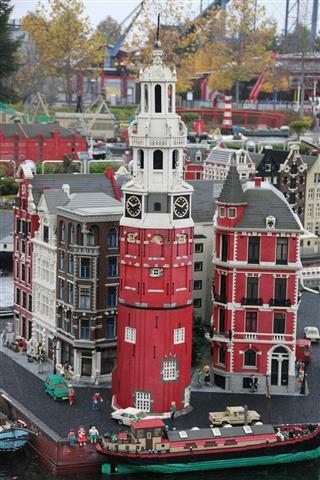 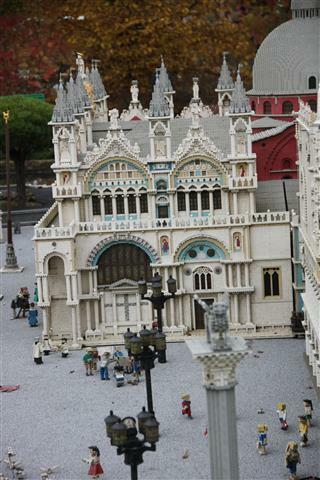 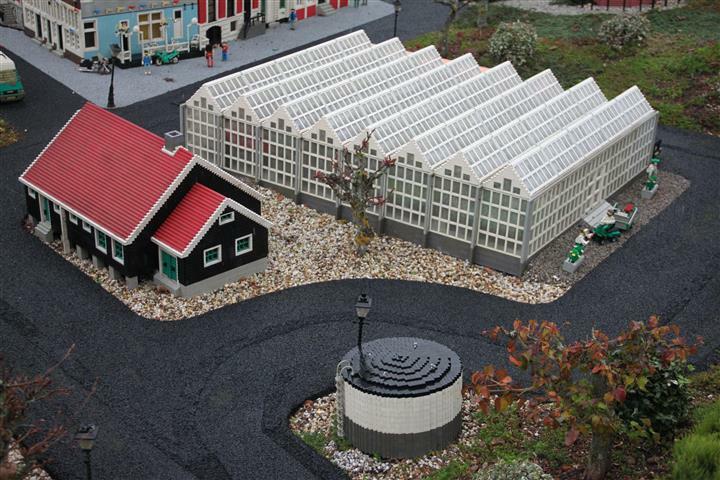 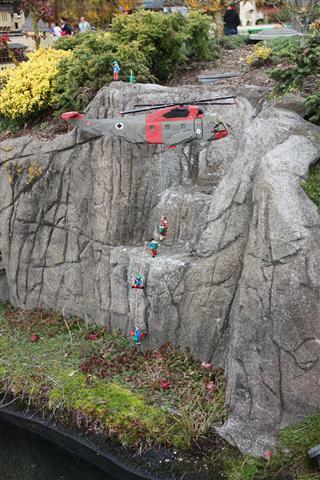 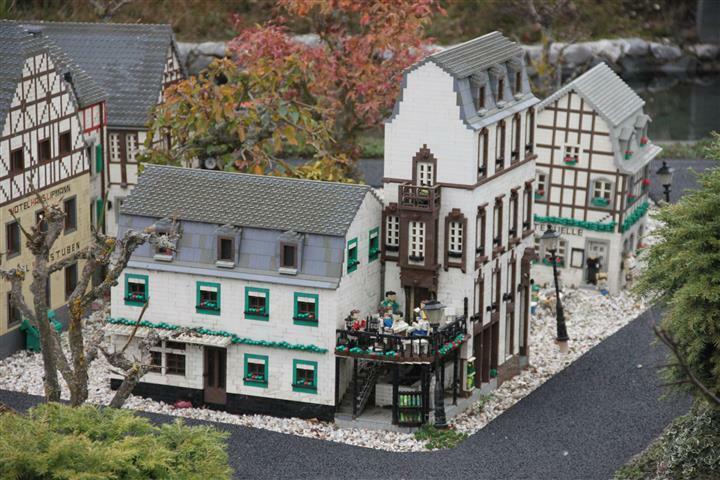 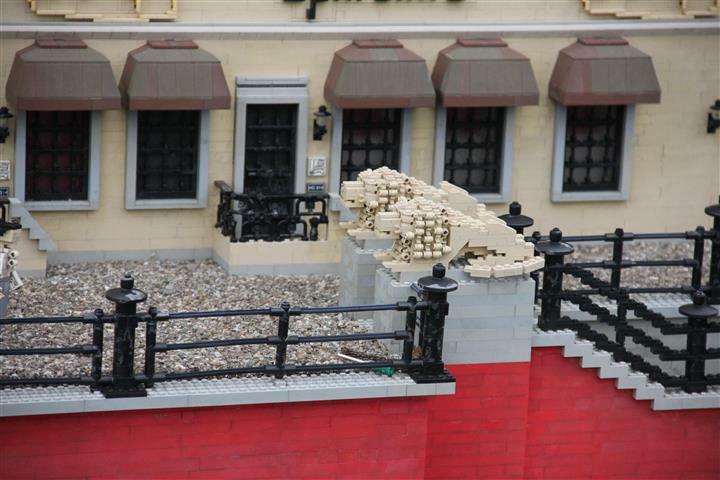 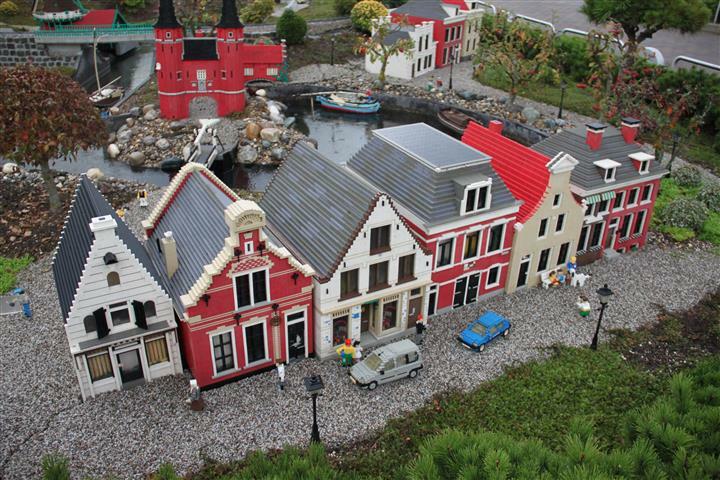 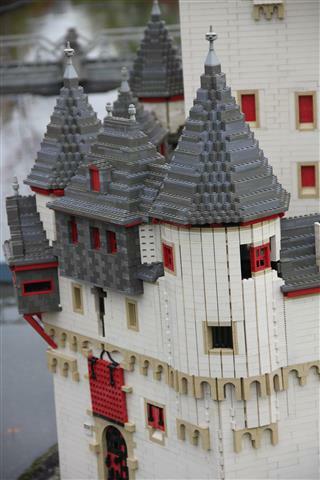 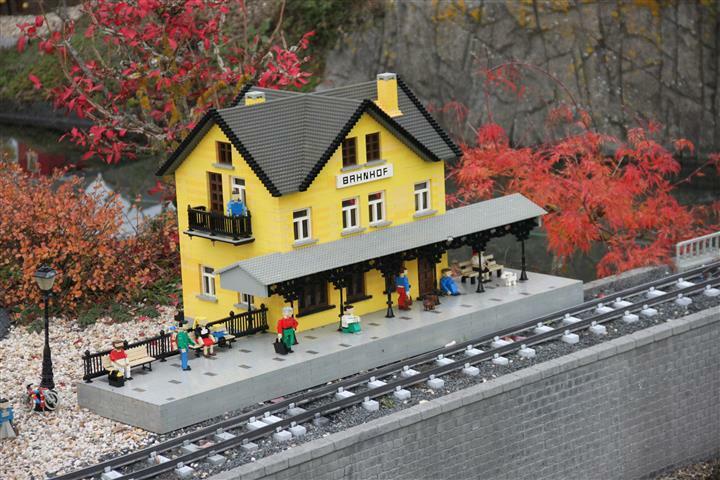 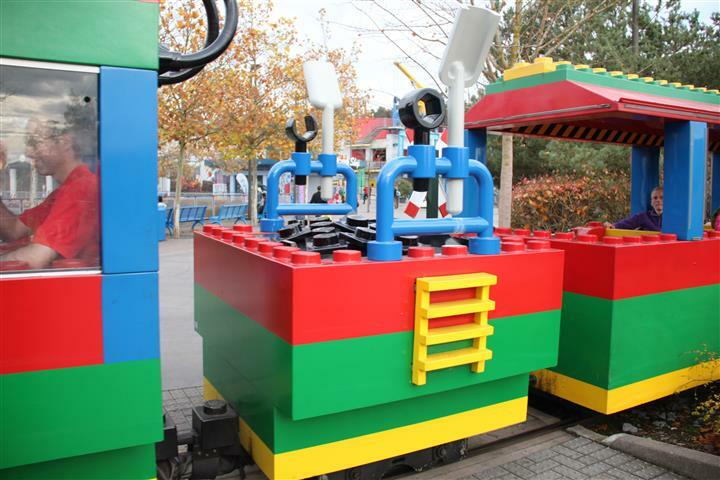 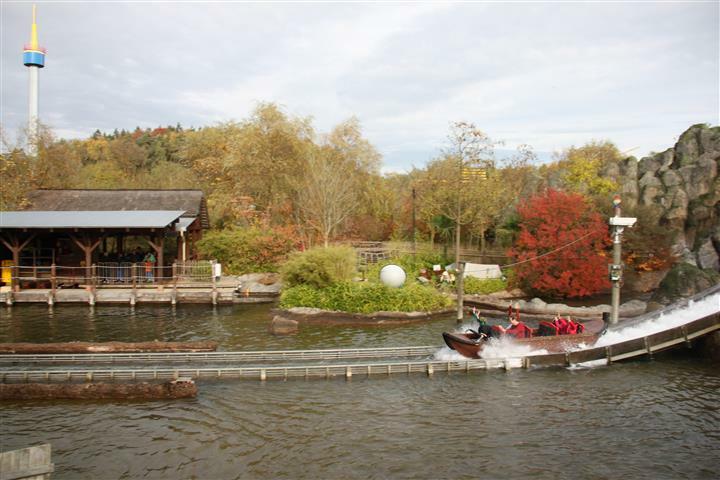 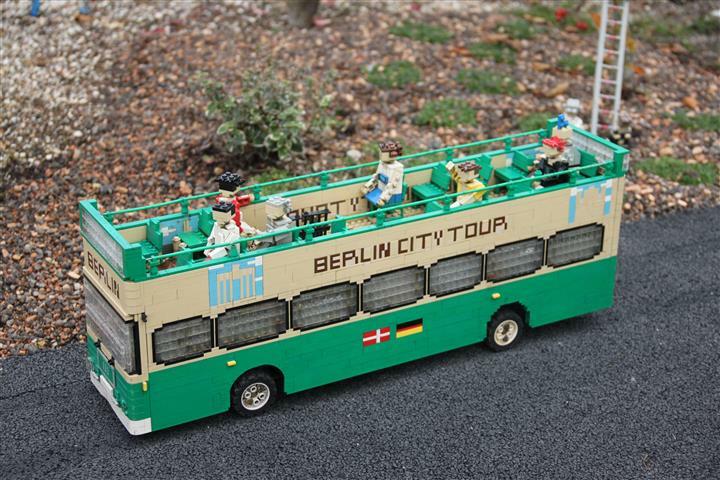 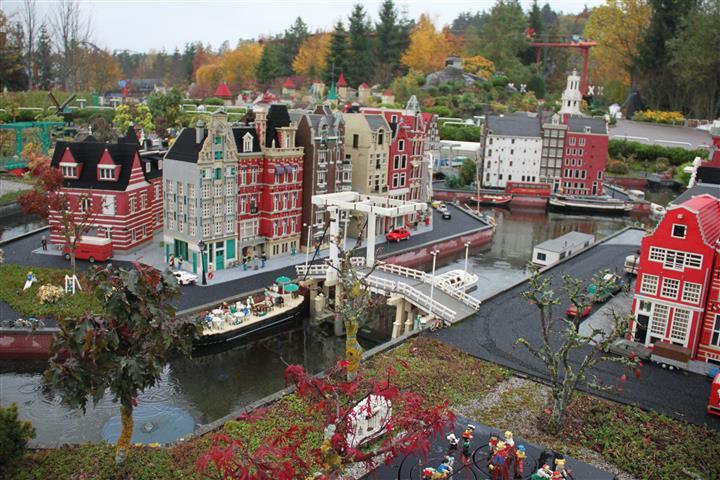 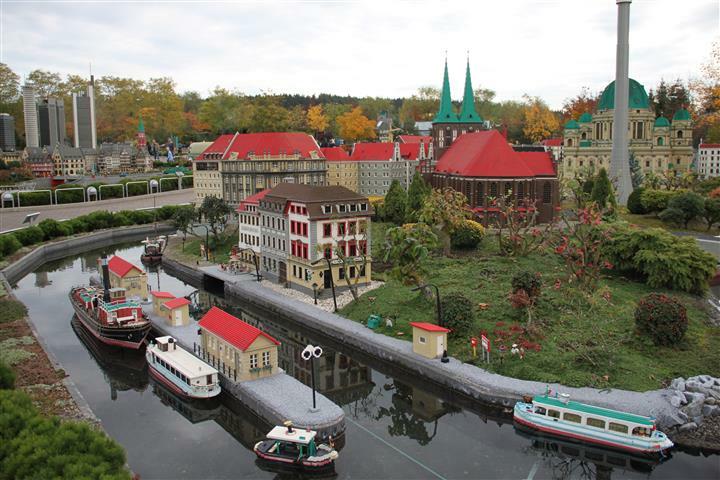 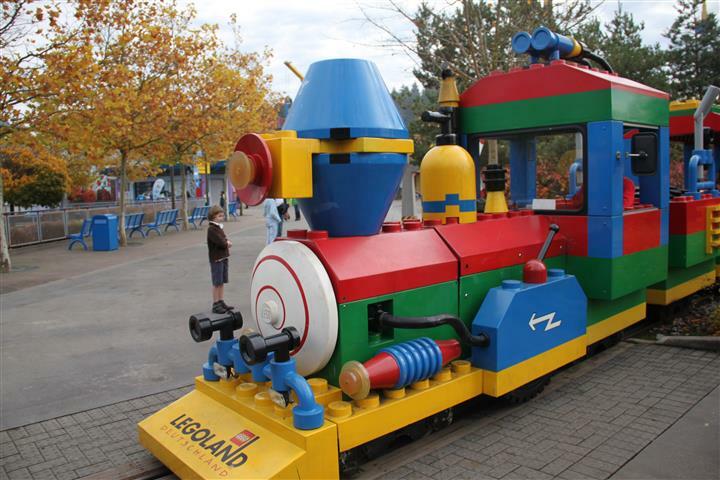 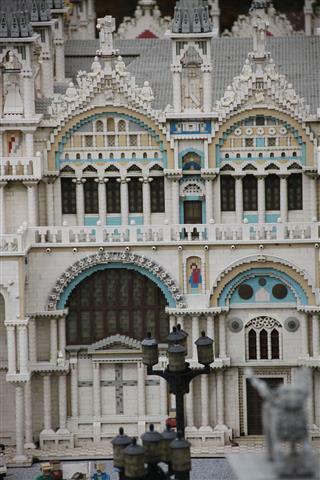 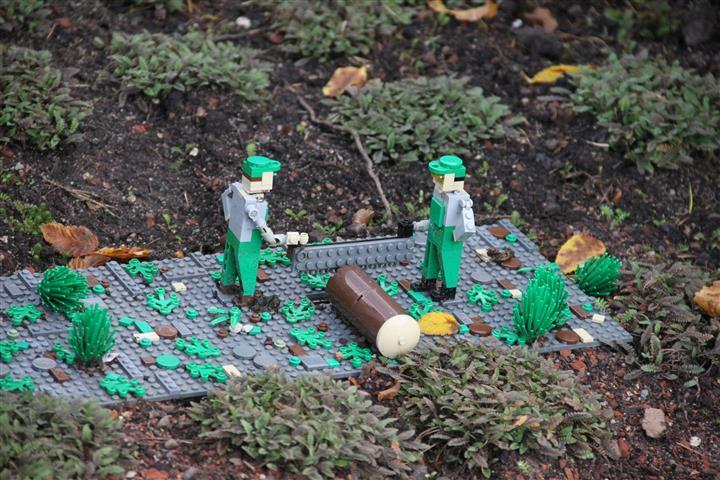 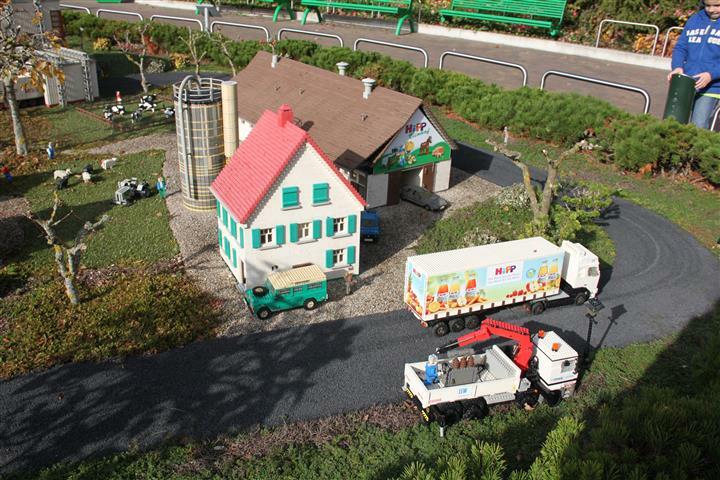 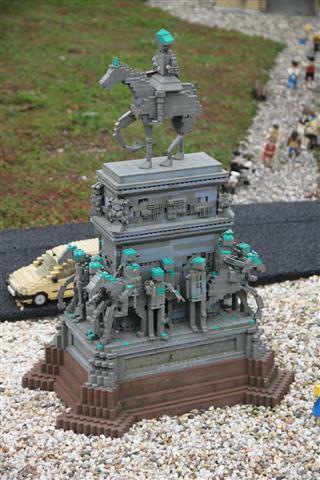 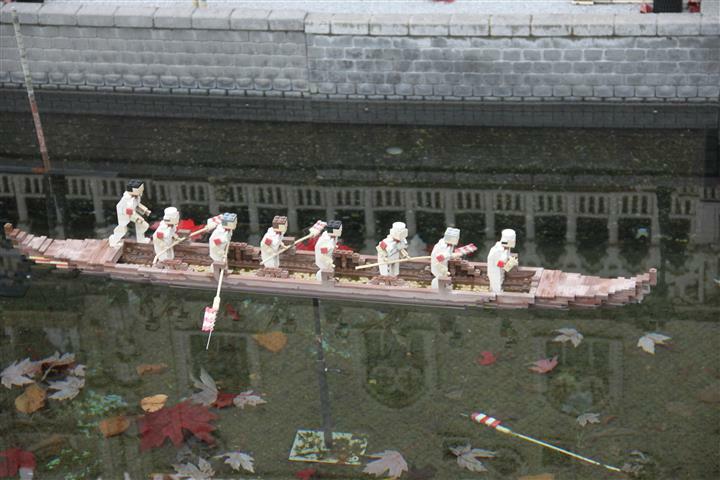 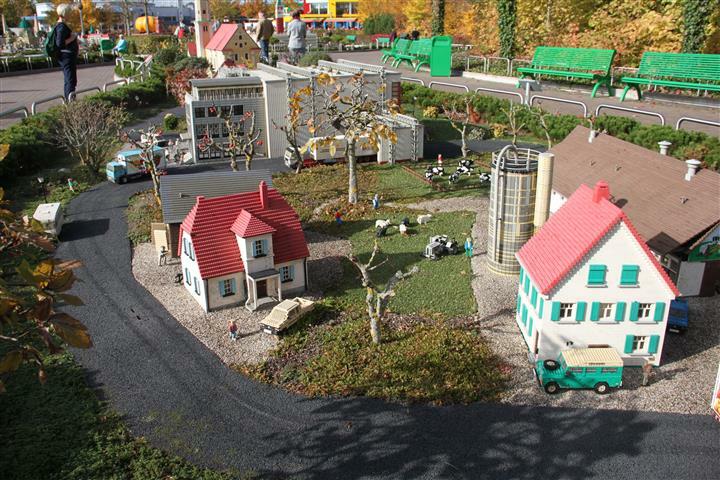 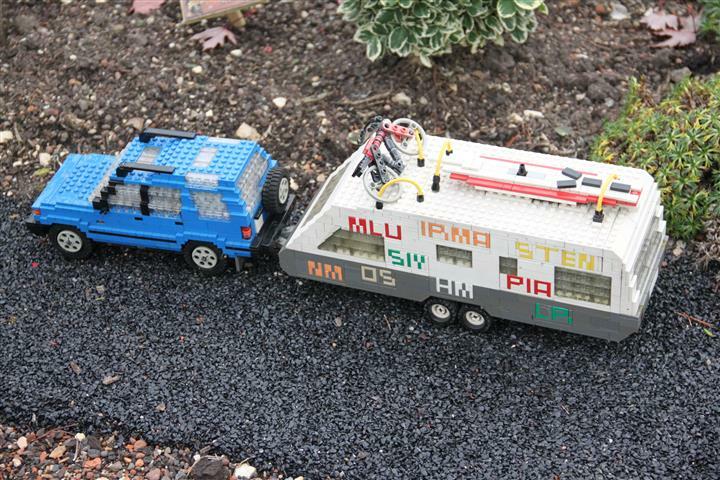 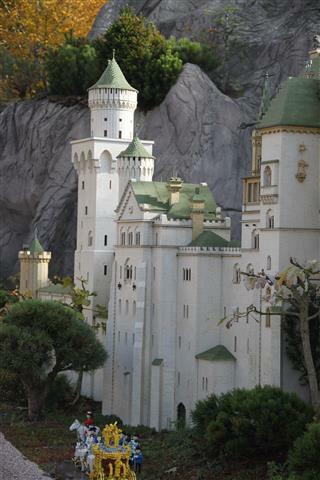 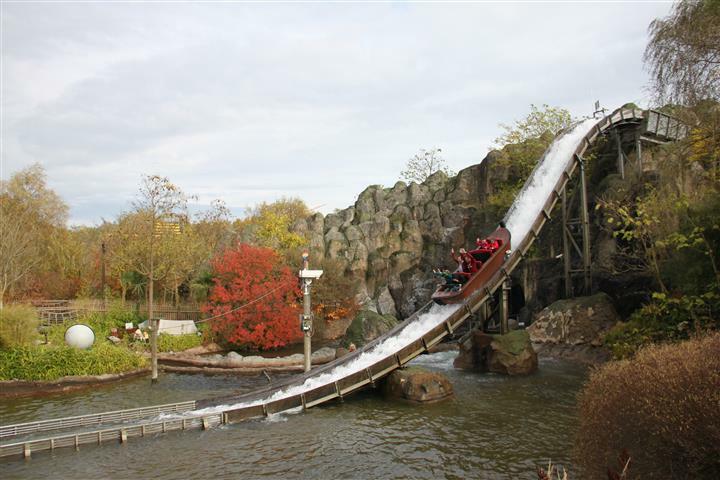 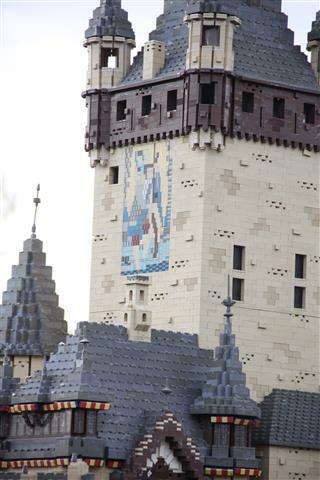 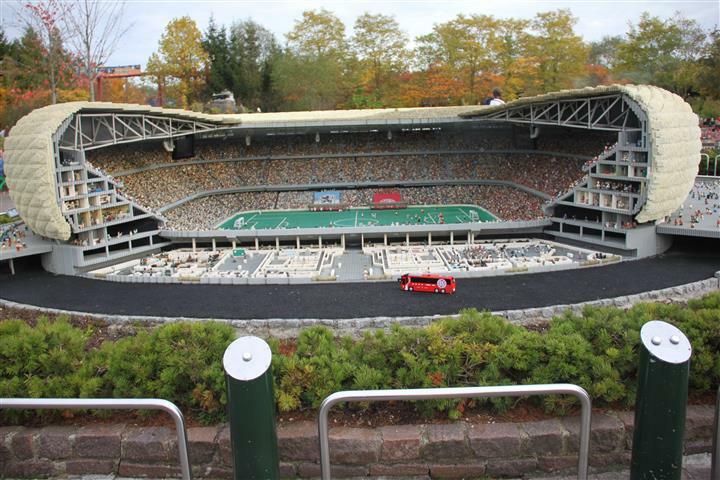 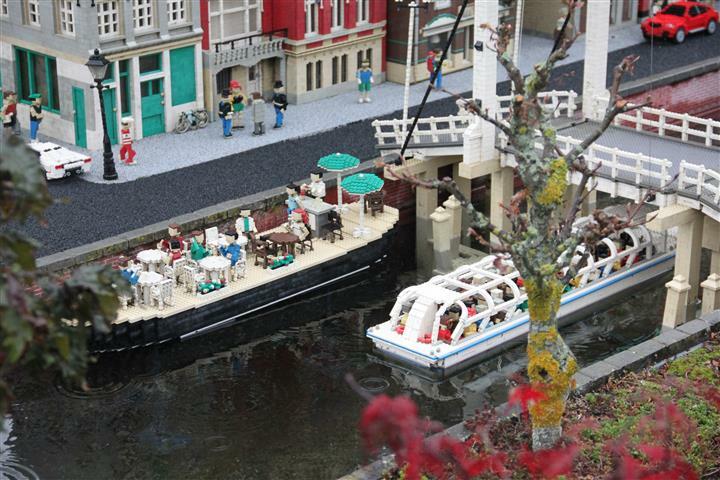 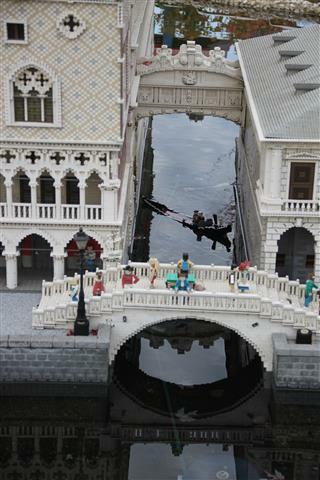 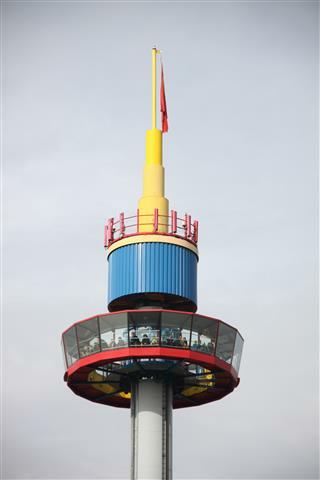 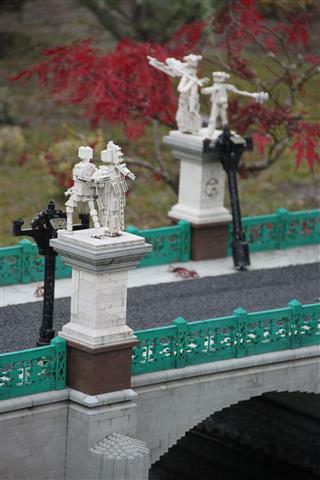 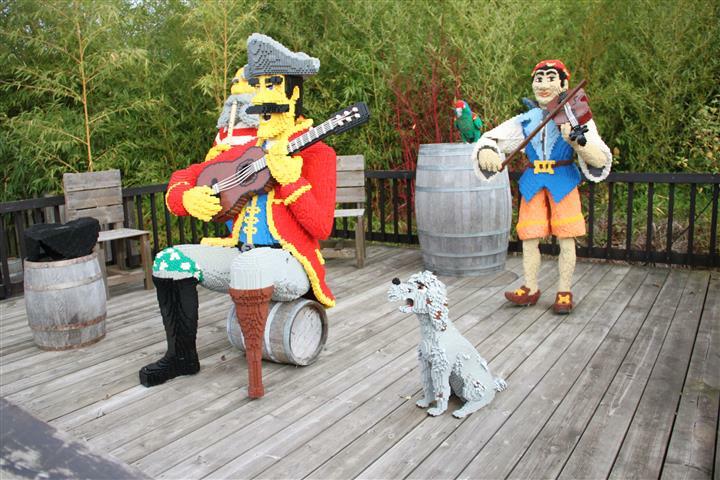 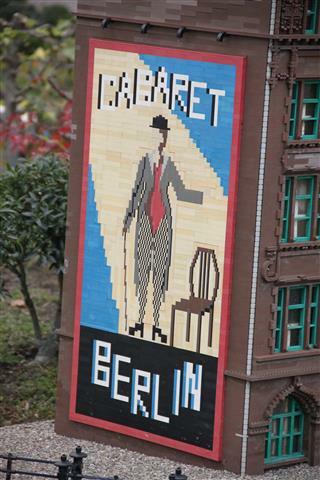 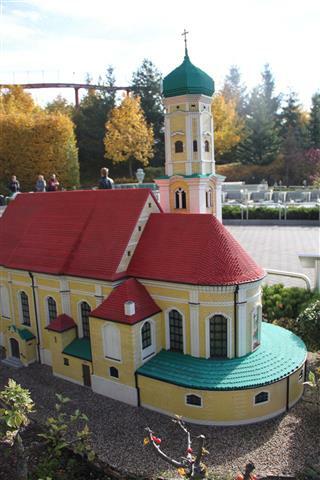 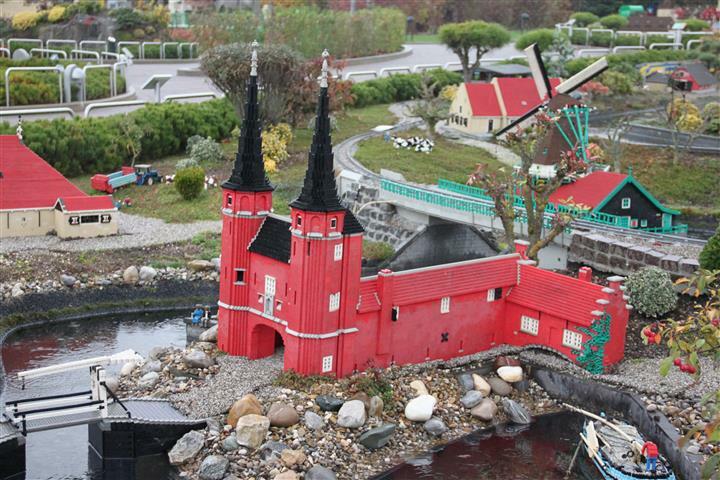 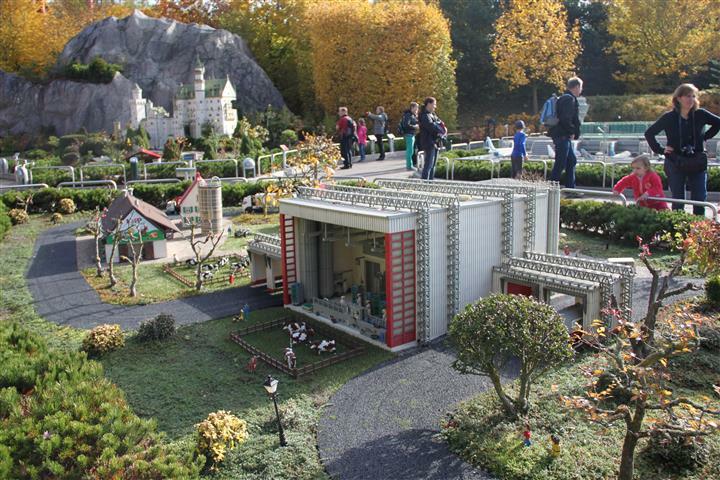 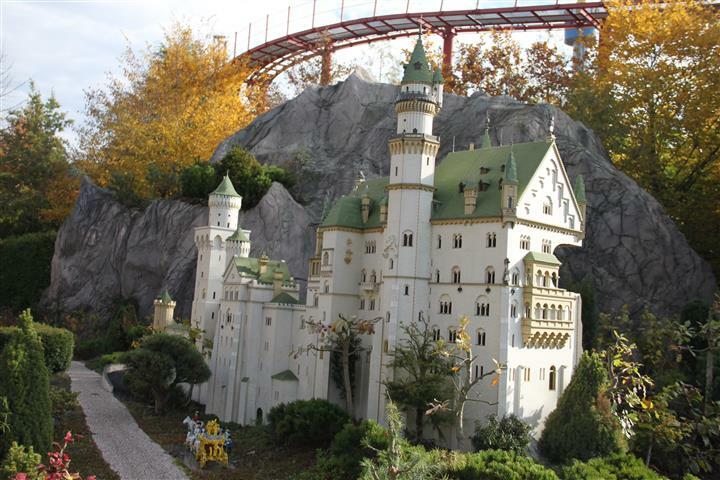 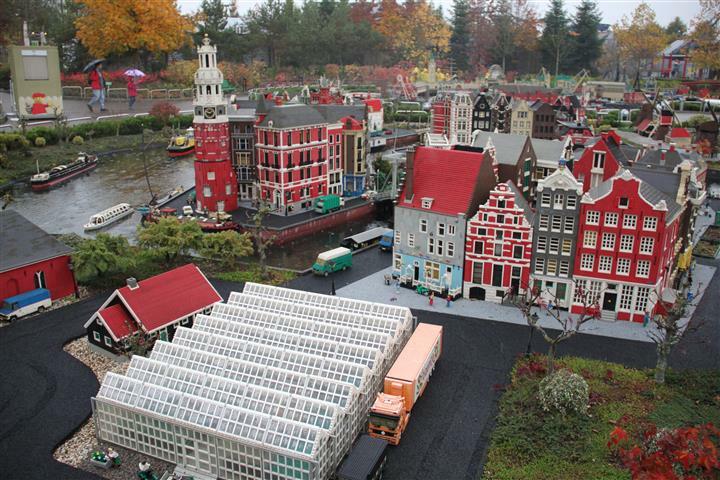 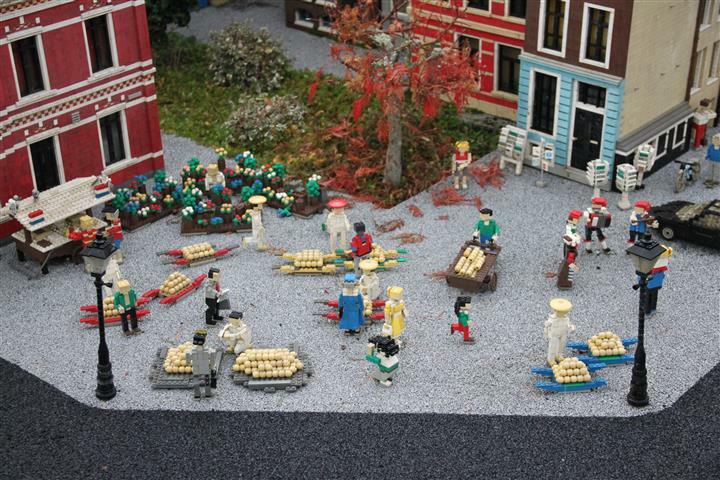 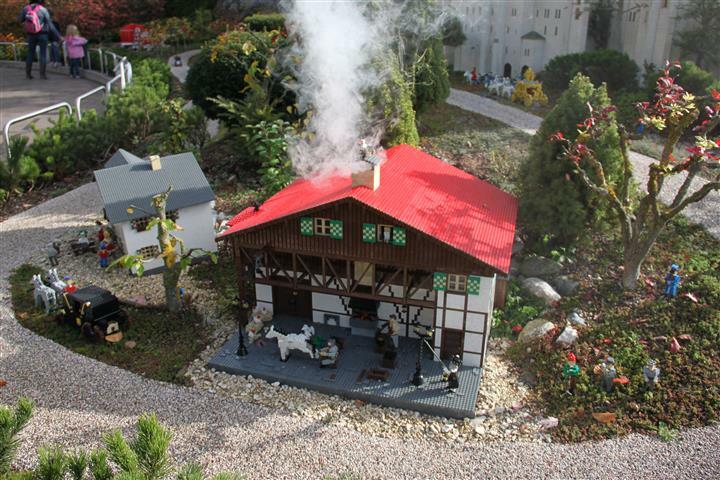 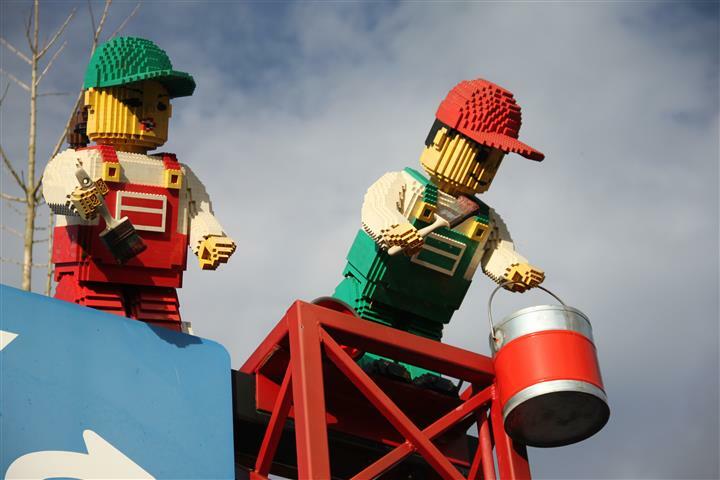 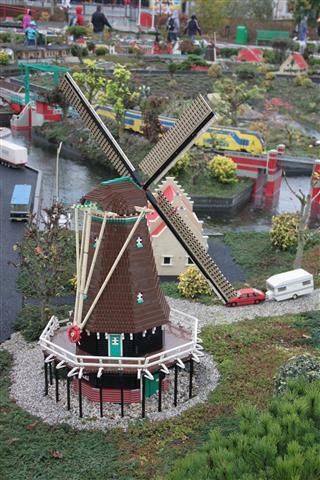 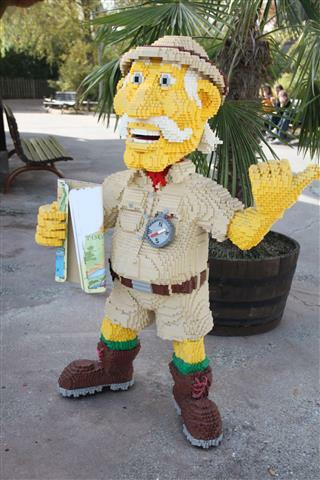 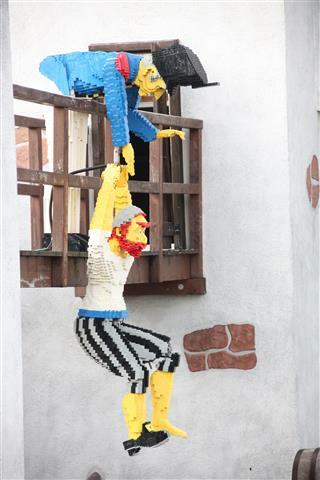 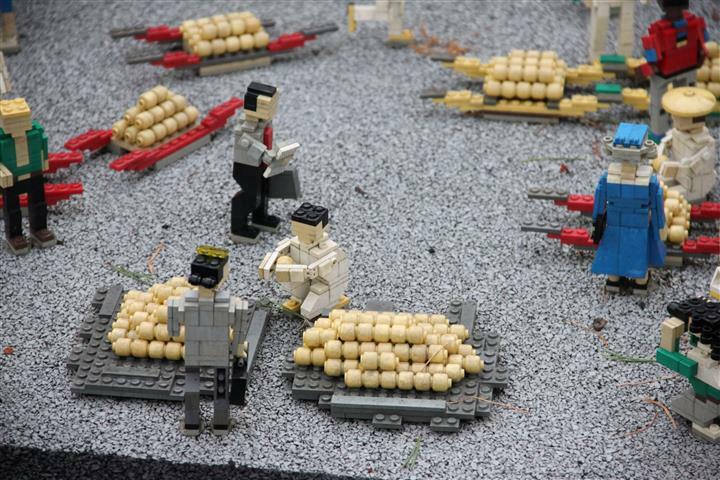 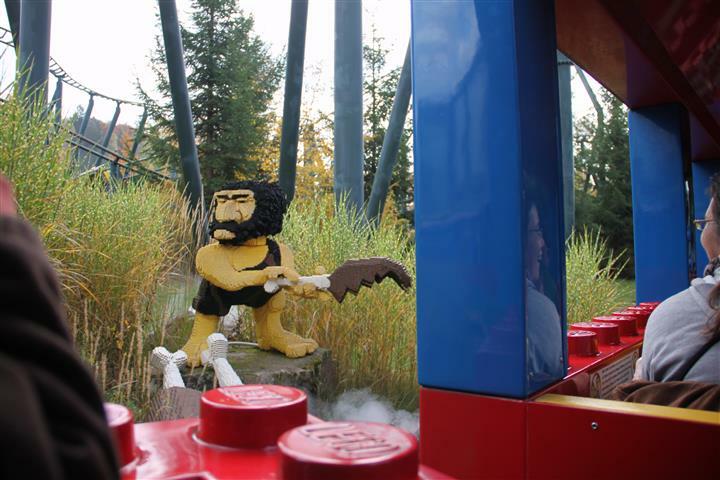 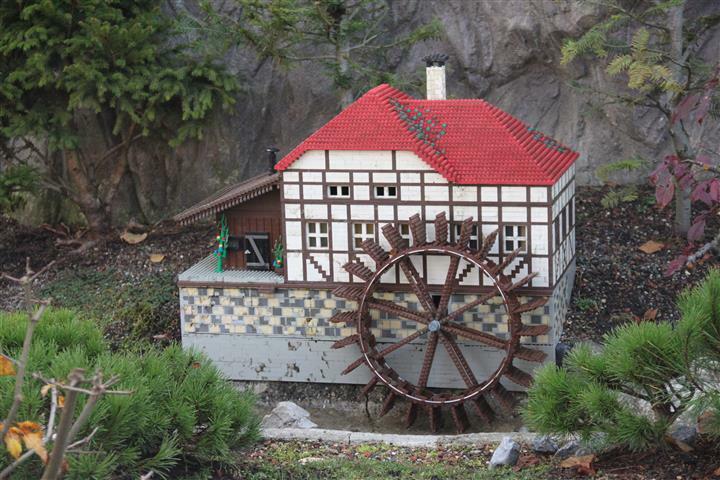 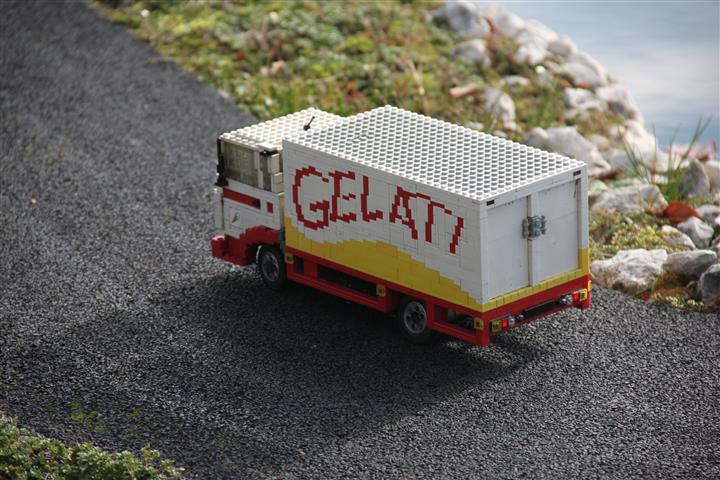 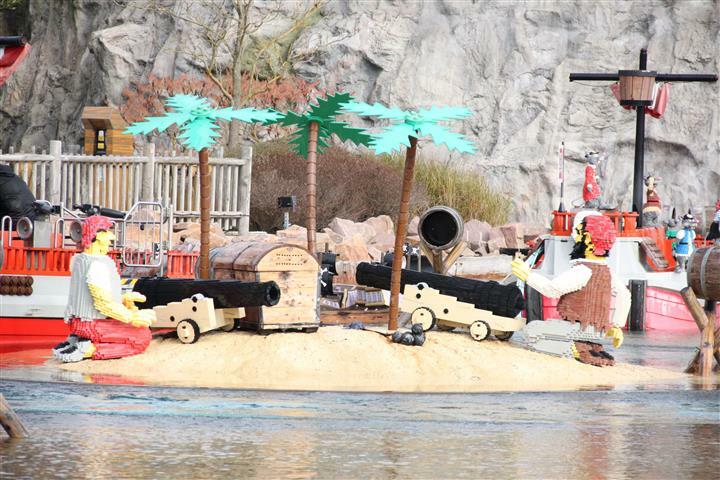 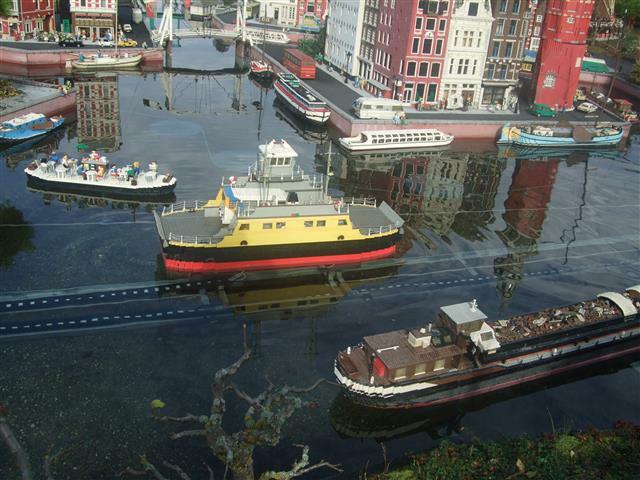 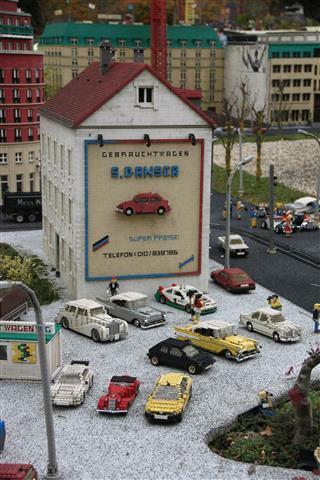 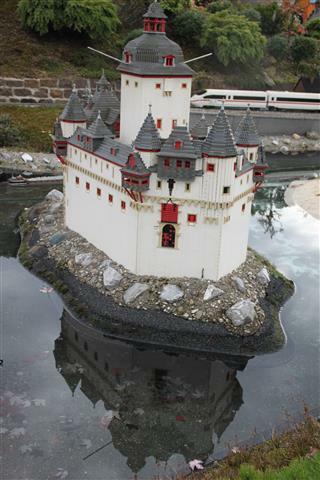 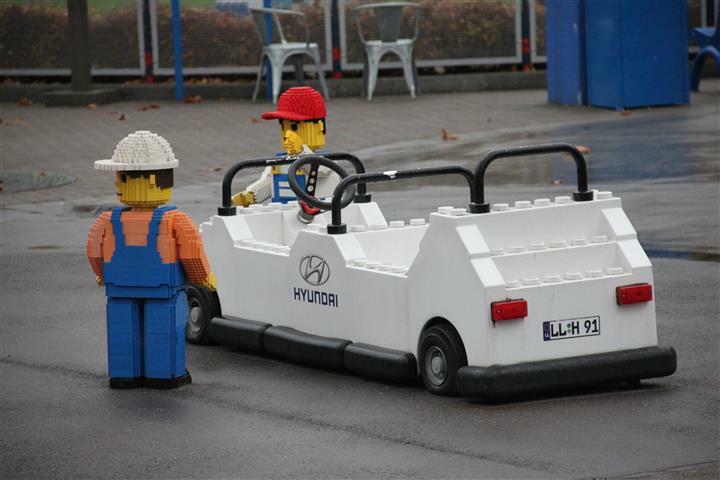 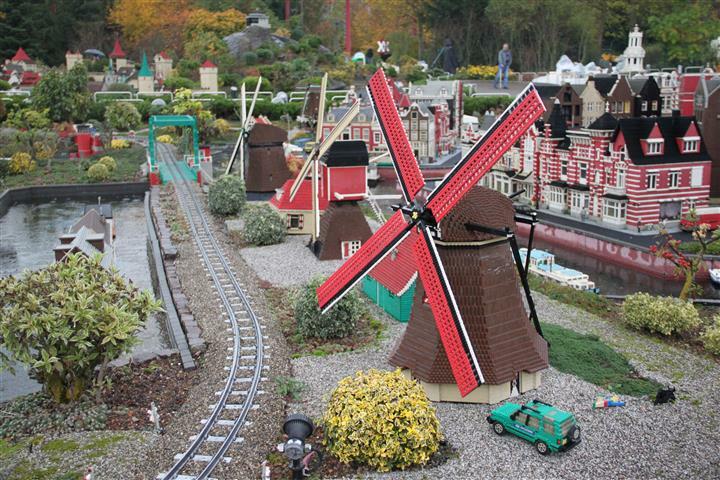 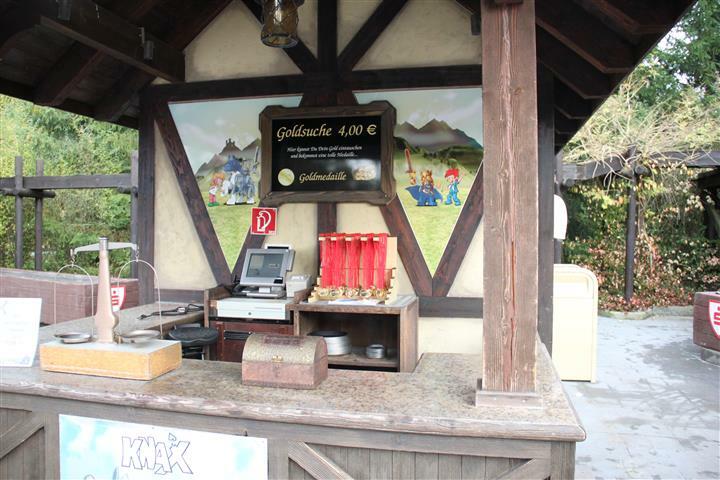 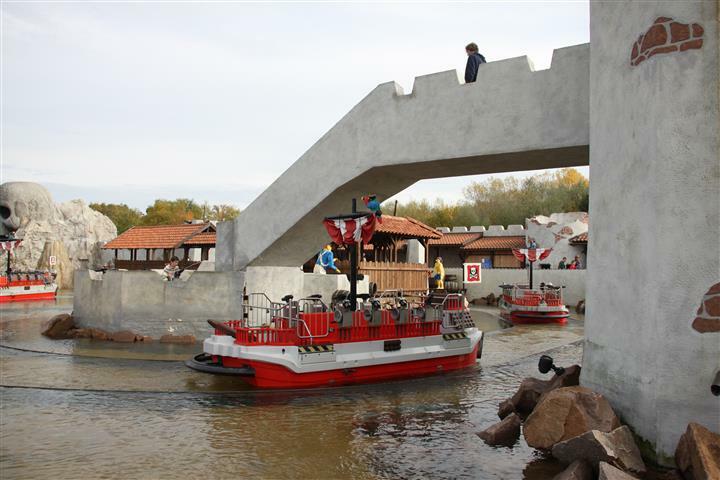 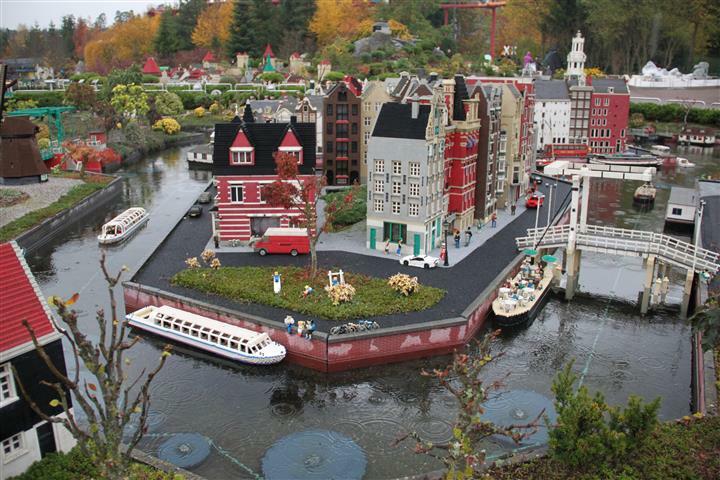 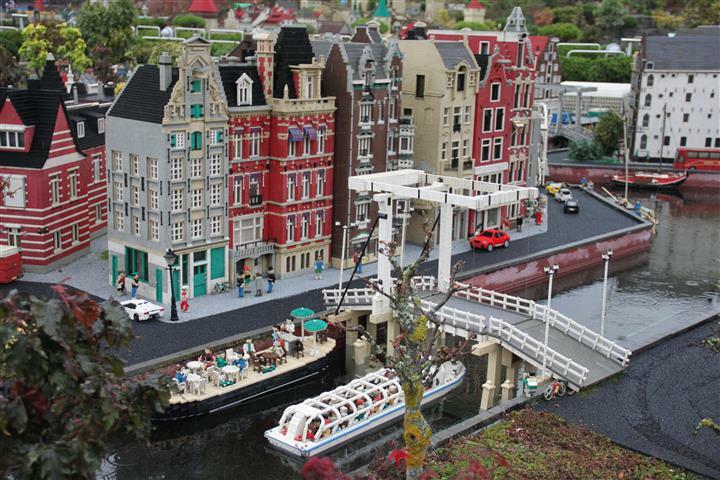 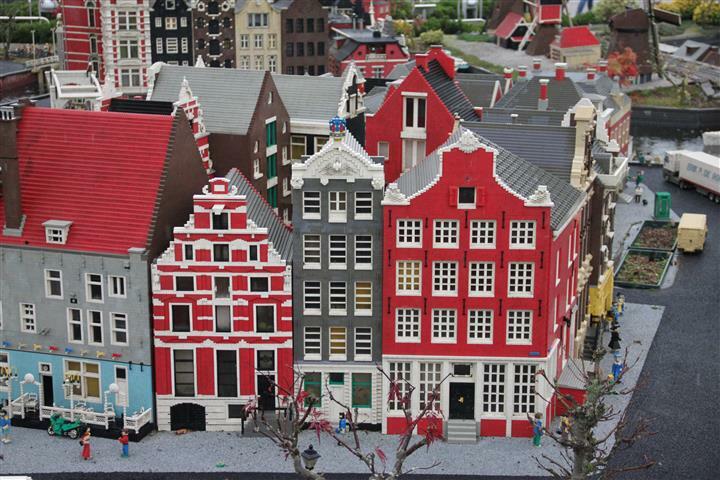 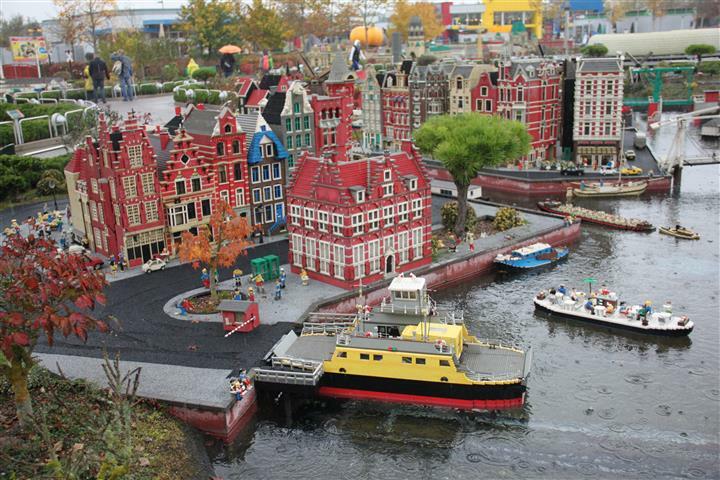 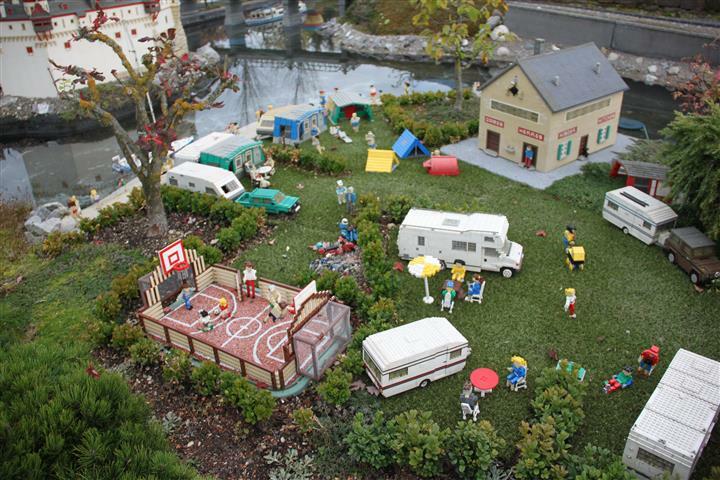 We are back to my archive posts about Legoland Gemany for my last few posts. 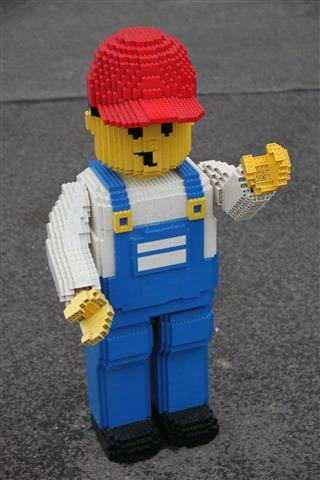 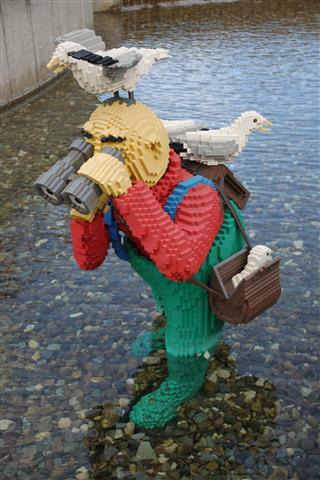 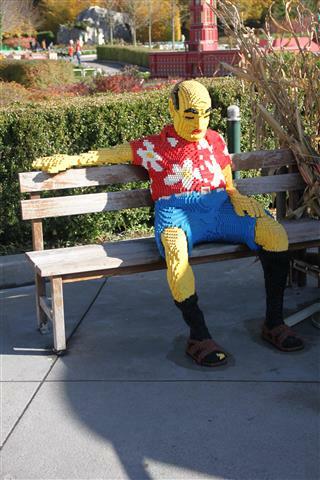 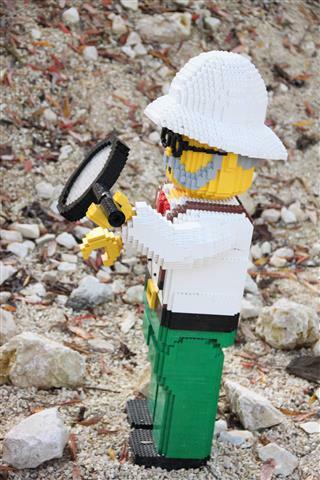 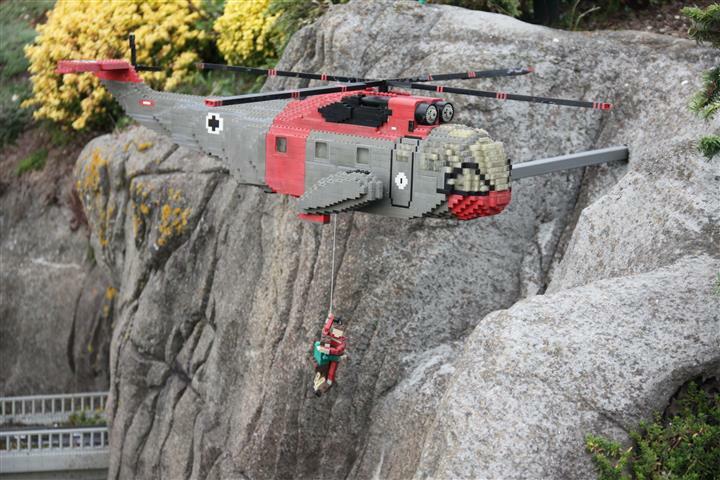 Once again the Lego figures have captured our attention, there are more of them than I imagined, many are bigger than I imagined and all of them have more detail than any of us imagined. 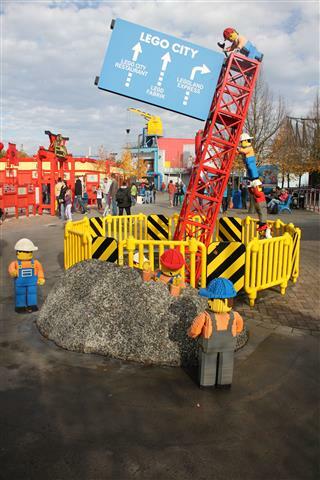 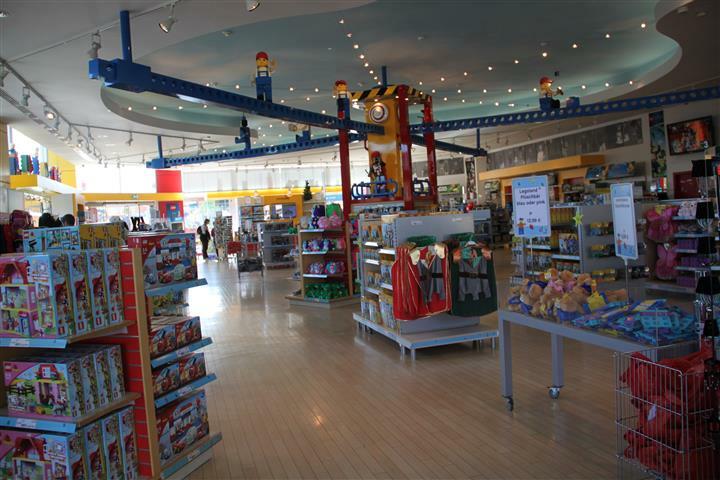 This place has reconfirmed for Little Mr that his dream job is to be a professional Lego builder when he grows up. 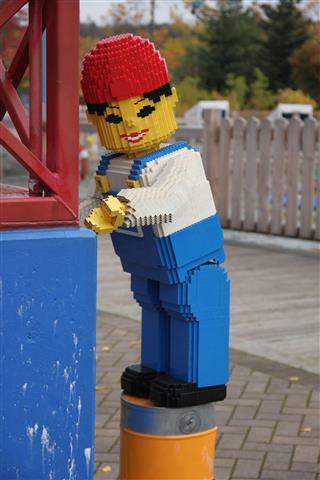 He probably has the same ideas as several million other nine year old boys… only time will tell if he ends up as a qualified engineer working in the industry of plastic building bricks or not. 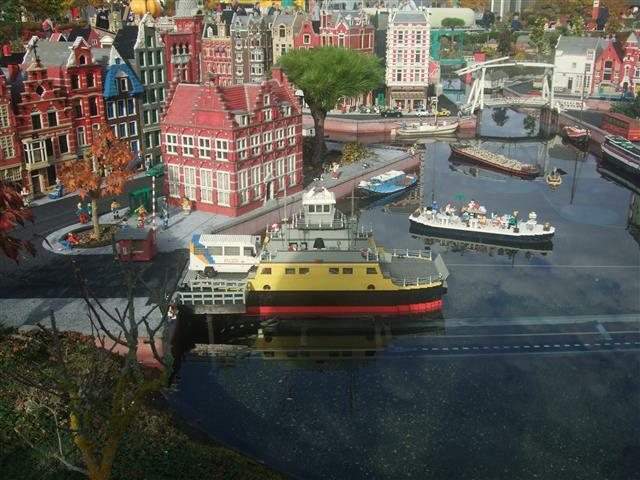 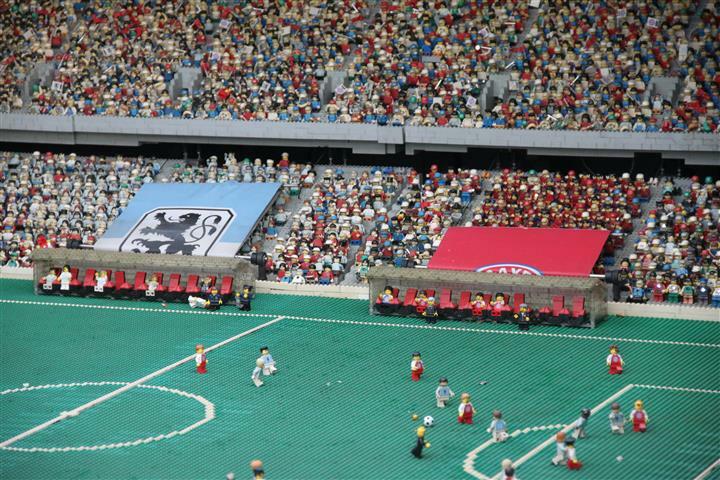 I’m back to my retrospective posts, detailing our travels and experiences in Legoland Germany. 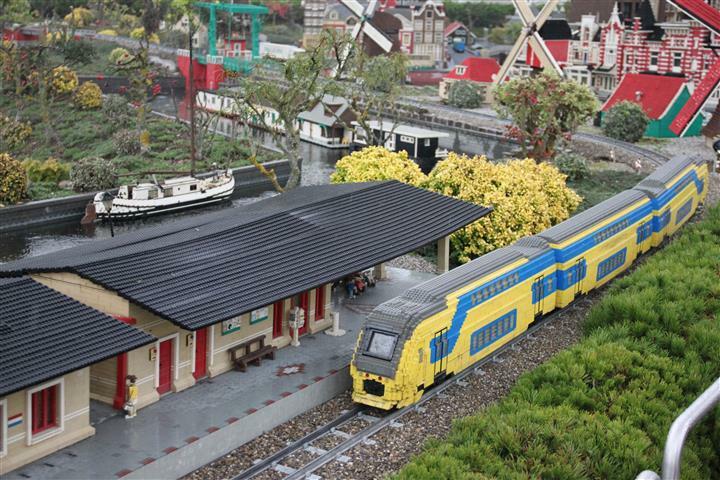 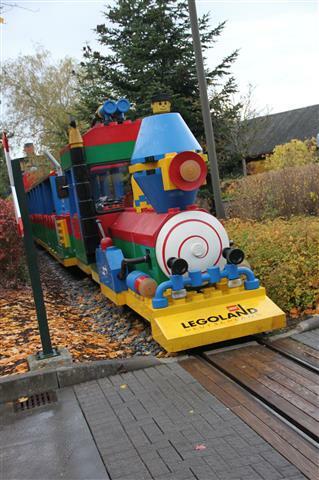 One quick way to get tough overview of the park is to take the Legoland train. 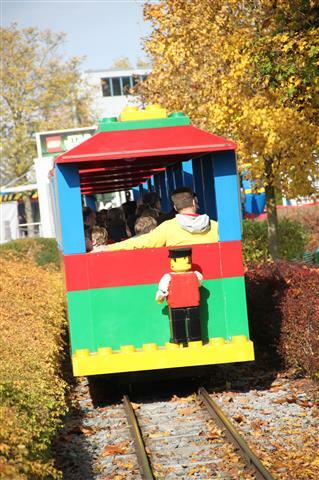 On the plus side, the train takes you around the outside of the mini-Lego countries and cities, under part of the Factory and around the back of it and then back to the “Train station”. 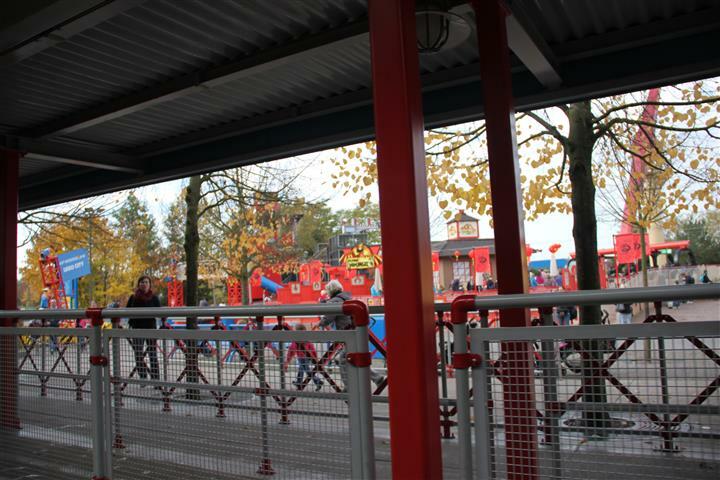 Slightly more negatively, there is only one station, and since I was on crutches and given the size of the park, I would have ideally liked to have seen at least four of them. 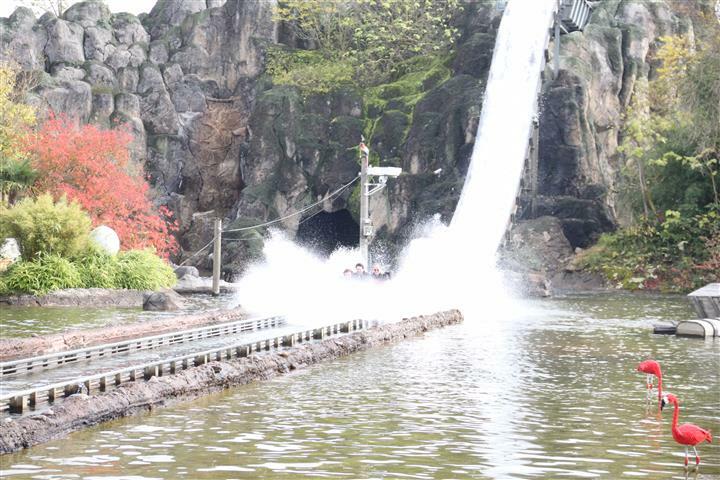 I was also a bit disappointed that the train doesn’t go past/through several sections of the park at all, but that again was tempered by the fact that we were lucky enough to have stayed long enough to go multiple times during the week so we simply did one section on one day, a different section the next etc. 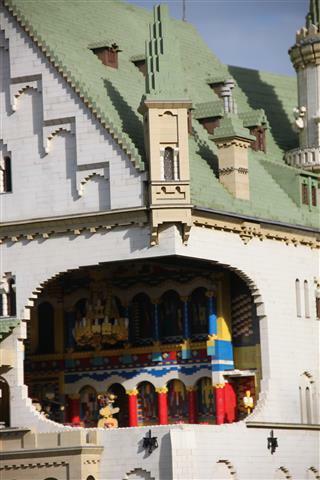 My biggest tip would be to get the Family Year pass and come as often as you can, taking it all in, in small bites rather than trying to cover everything on a single day. 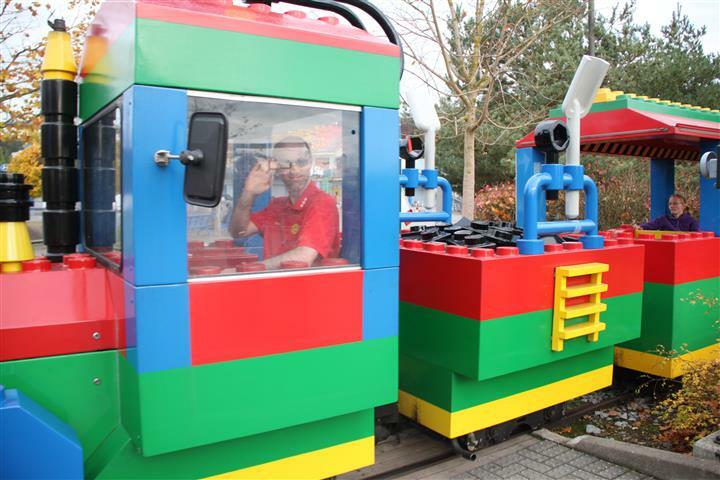 As you can see from the photographs, we not only rode on the trains on the different days we were there, we also stood at crossings and waited whilst they went by and without exception, every time a driver saw us waving and taking photographs they responded with big smiles and friendly waves back. 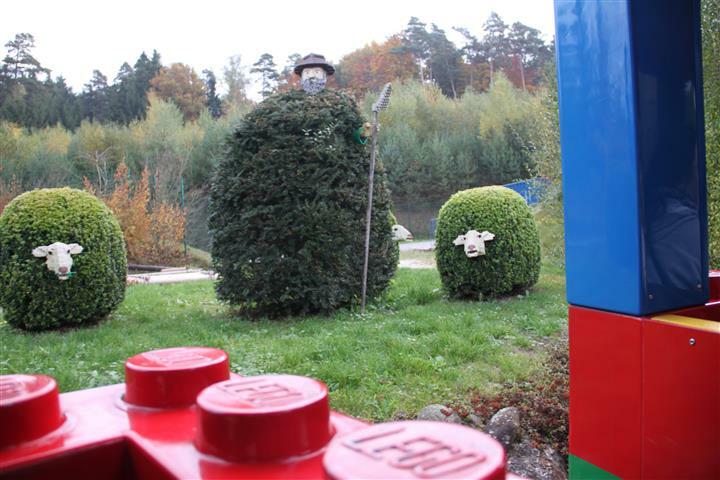 One thing that raised a laugh all along the train was that after we passed under the Factory and saw the robots working in the basement, we exited into the daylight, turned a corner and saw a “shepherd” and his “sheep” which were bushes with the appropriate Lego heads, hands etc. 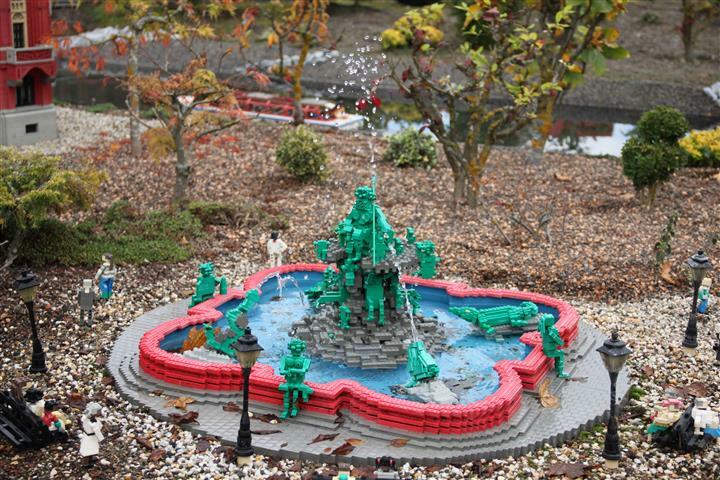 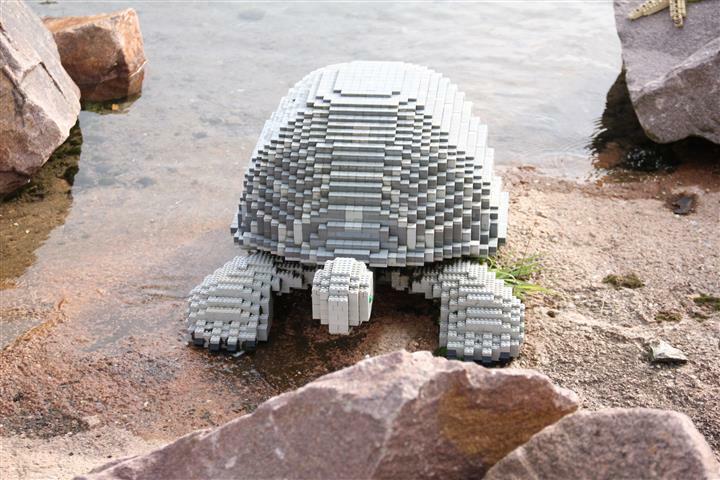 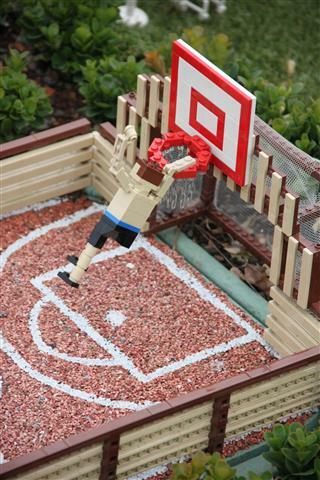 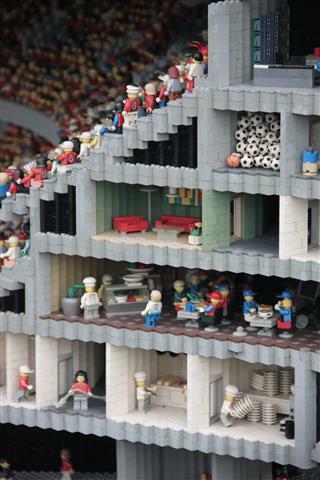 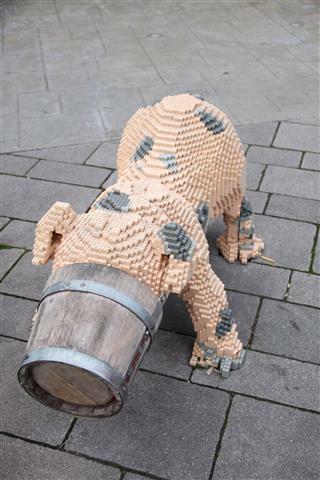 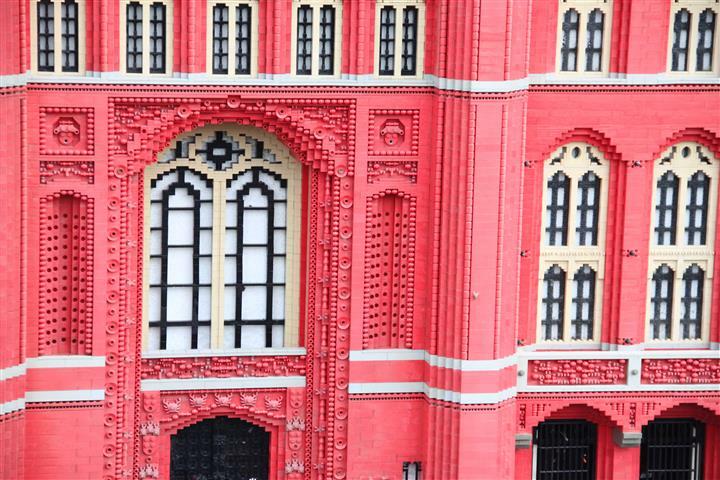 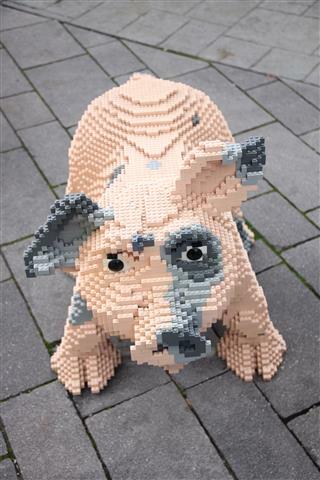 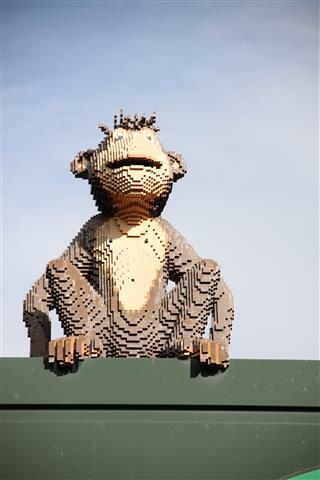 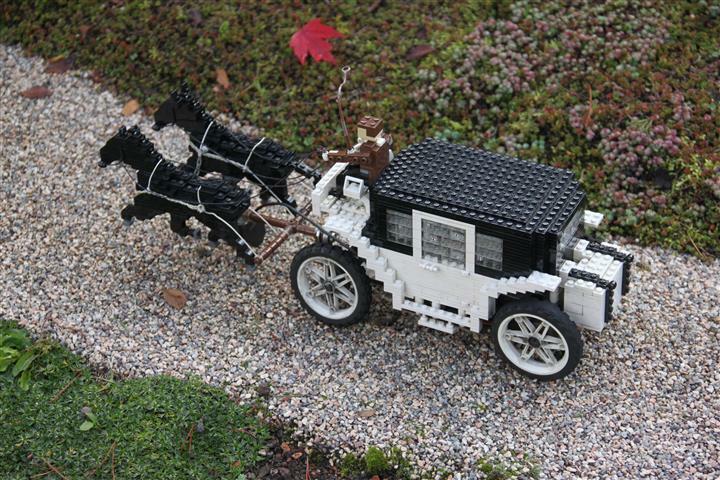 It was just another example of the inspired imaginative spirit that is behind the Lego brand and park. 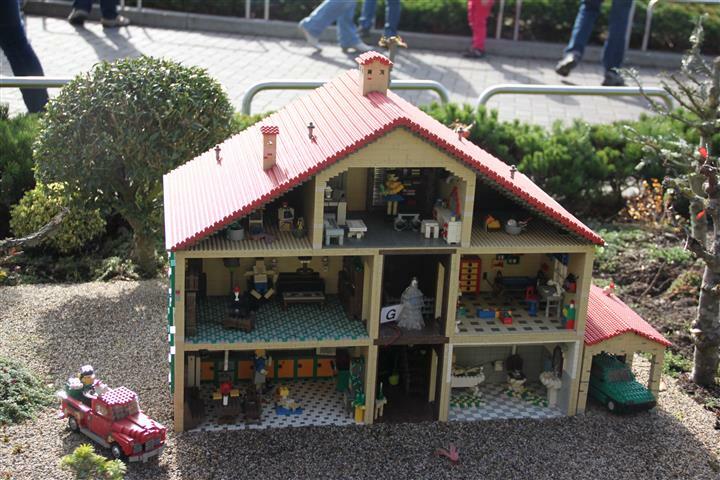 This all goes a long way to explain why every member of our family, even Kiwi Daughter who hates playing with Lego, were excited to come back here day after day, and after the first day she and I didn’t even consider staying back at the hotel as we’d origonally thought we would. 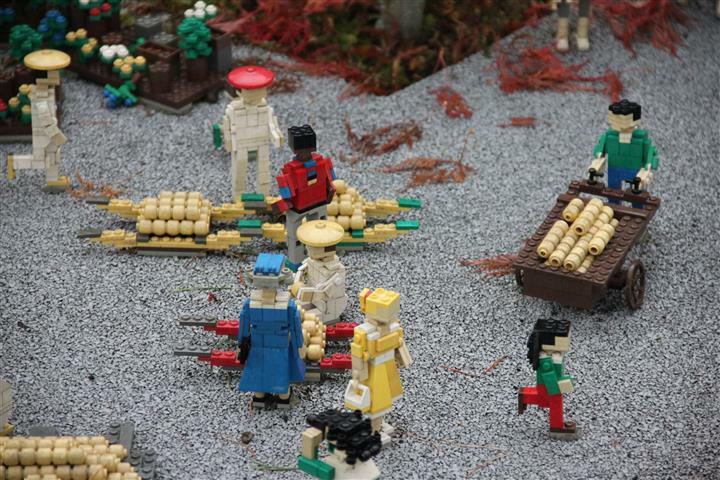 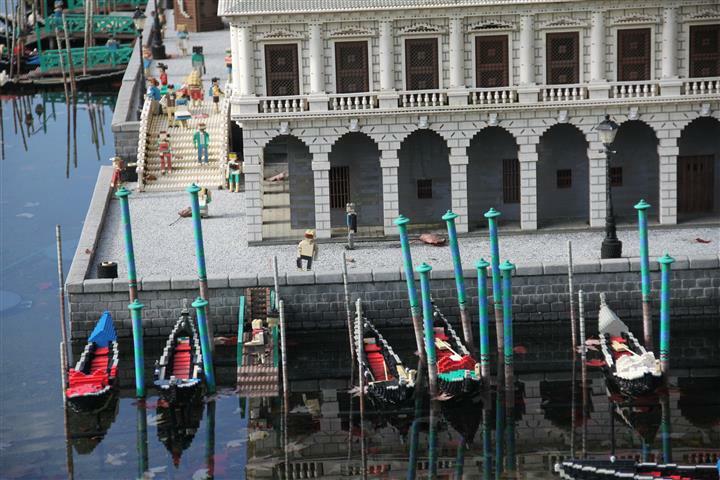 There is simply too much here at Legoland for me to post it all… Here is a quick glimpse of some of the other parts of the park that I won’t be going into detail of… but might give you a taster of some of the wonders you too can discover if you ever get to visit here. 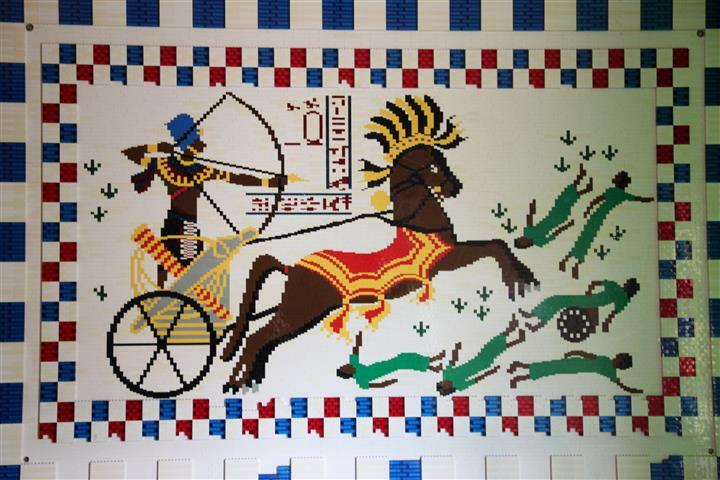 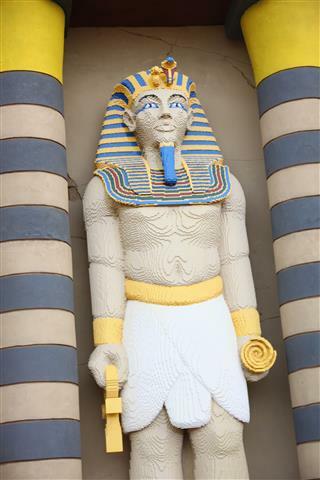 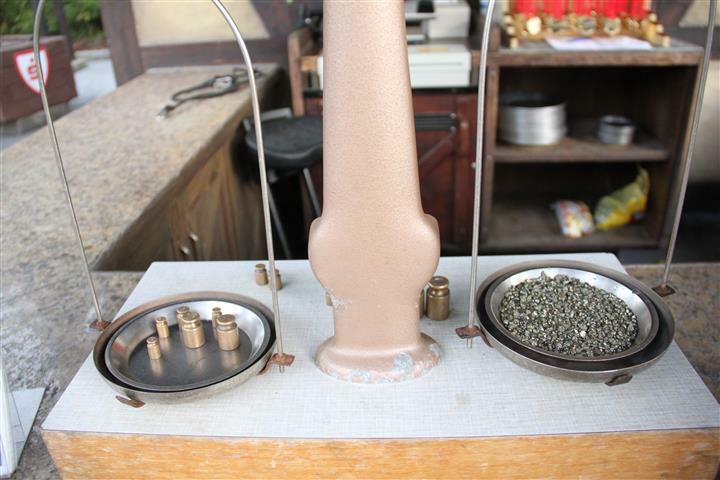 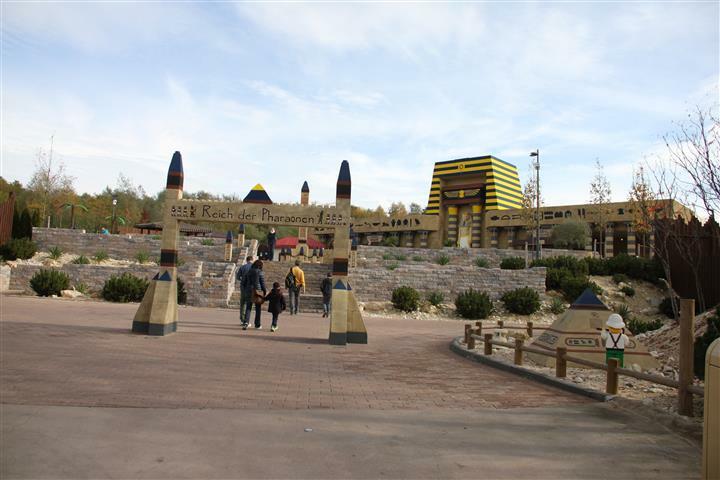 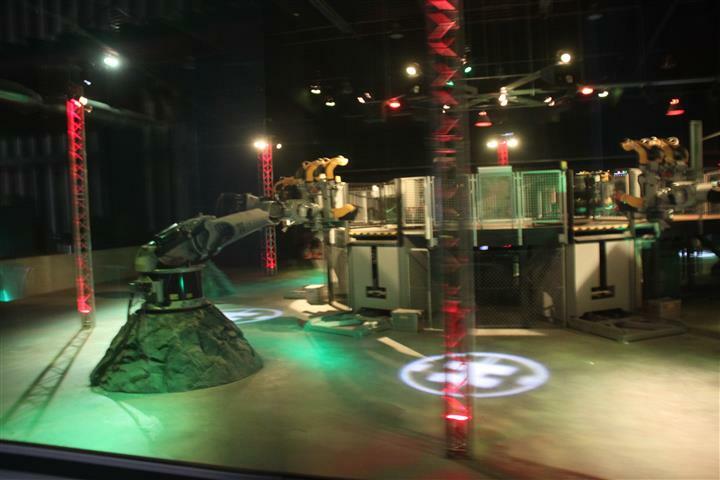 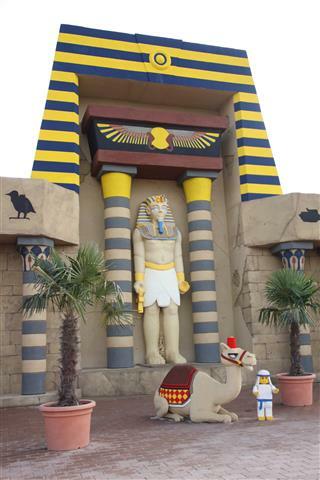 An entire section of attractions on the theme of “the Kingdom Of The Pharaohs”…. 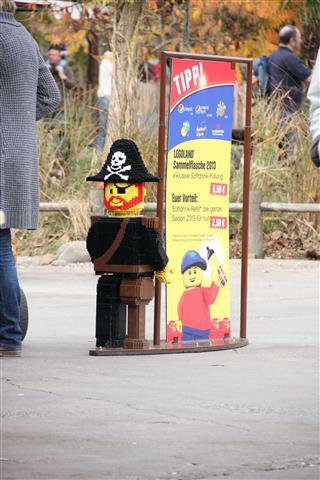 And the chance to make as few Lego purchases as you can get away with… He wanted (just about) EVERYTHING!!!! 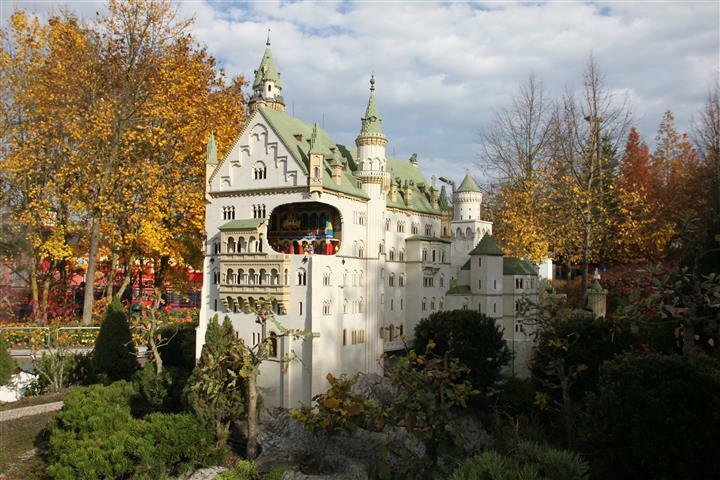 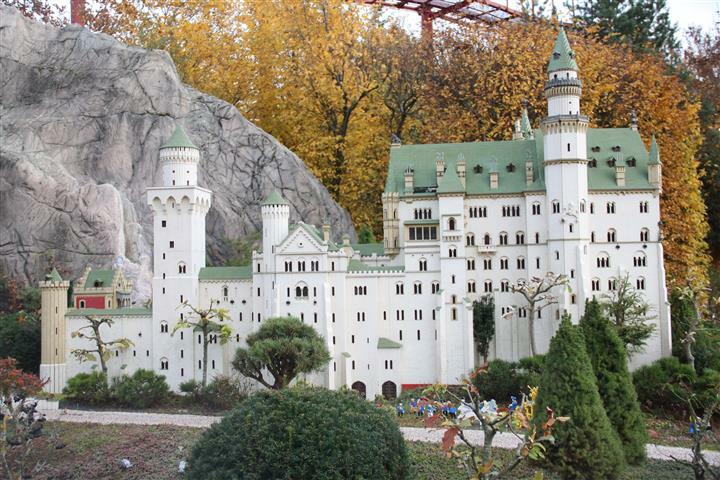 Our “journey” through some of the Legoland countries and cities continues, there are famous buildings from Lucerne Switzerland and various castles in Germany. 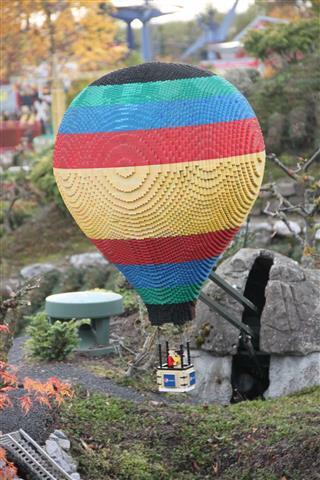 There is a hot air balloon that “flies” up and down, a helicopter that winches up a “patient” from a cliff face, there are chimney’s that give smoke, water wheels that turn, woodcutter’s cut wood in the forest. 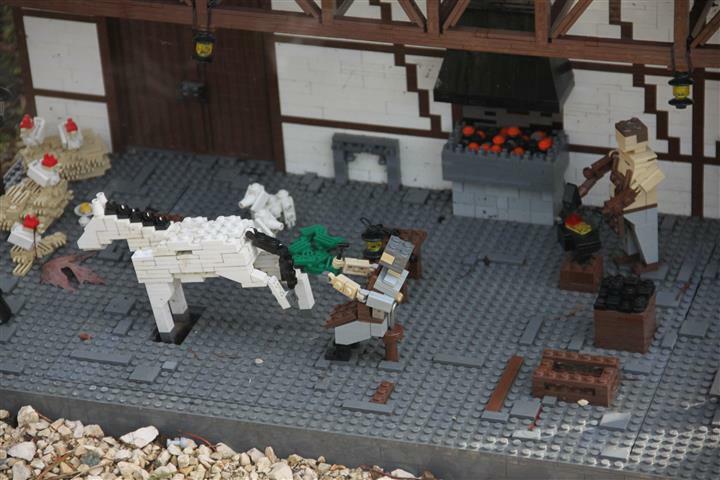 Even the cows”and sheep in the barn sing “Old McDonald has a farm…” and the horse that the blacksmith is trying to shoe is bucking. 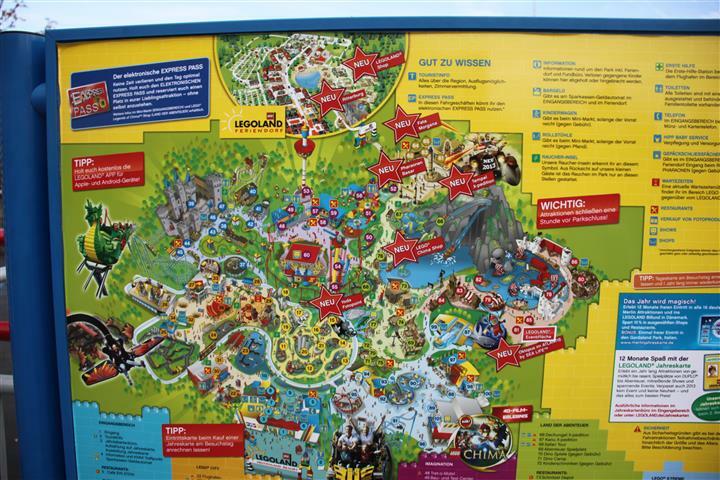 All of this, and more are to be found in just the lower central section of the Legoland park map, marked with a cluster of yellow numbers. 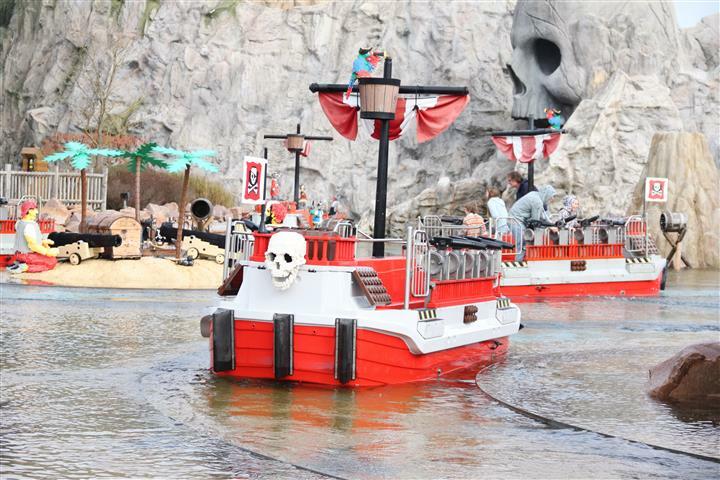 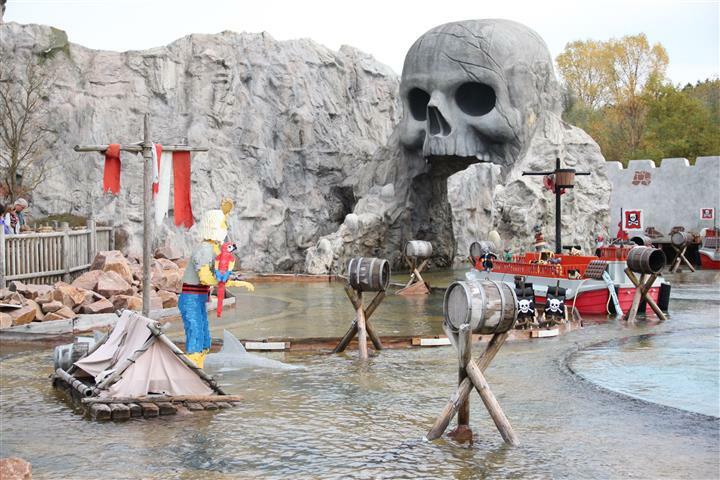 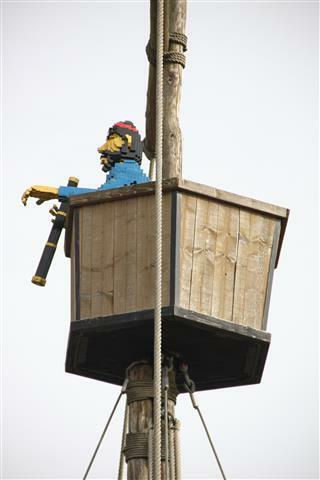 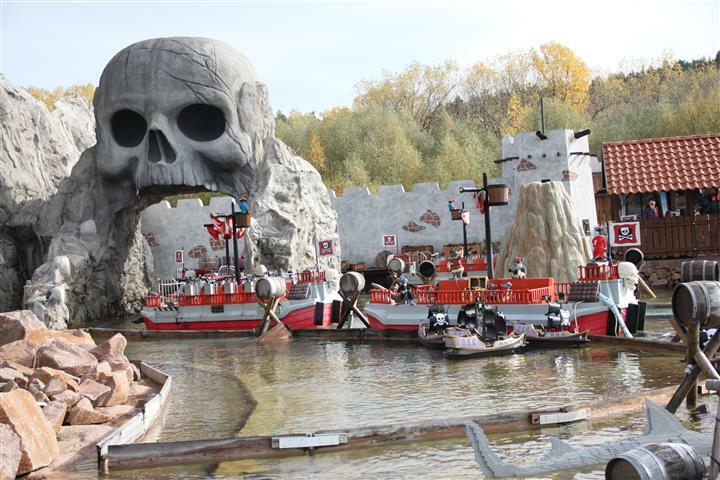 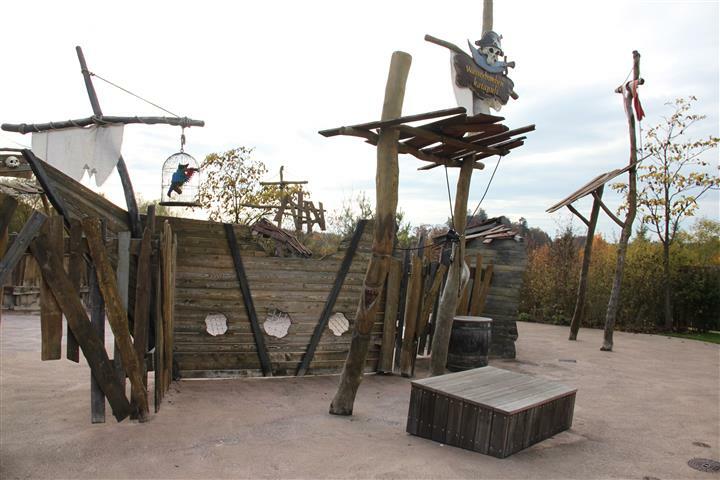 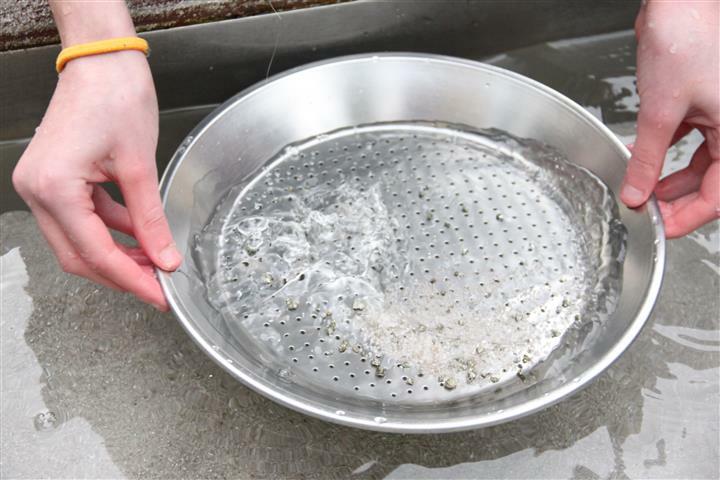 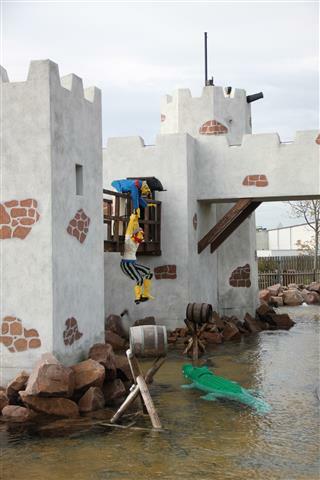 Bring Out Your Inner Pirate… And Prepare For A Soaking Me Hearties…! 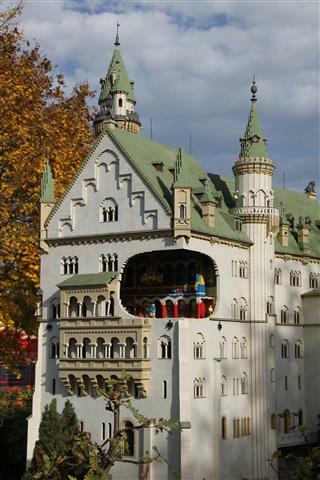 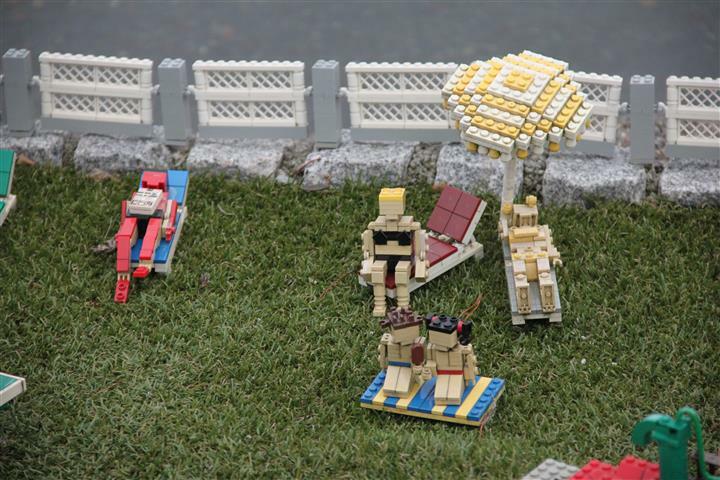 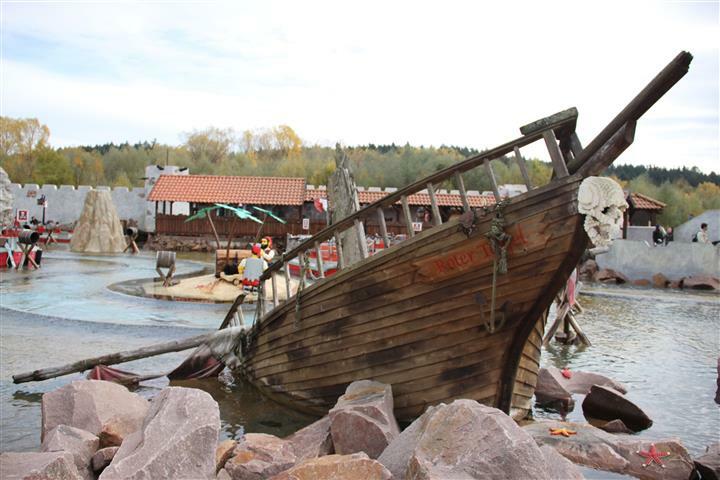 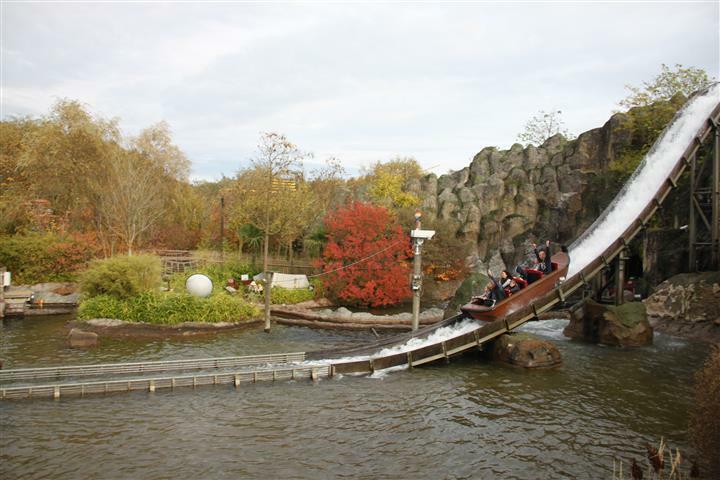 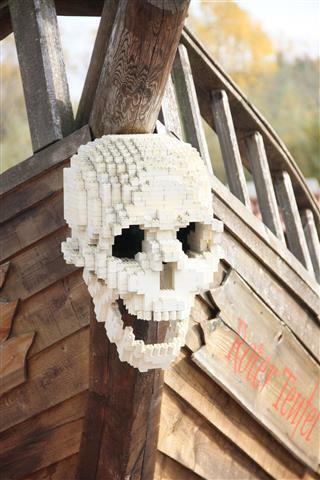 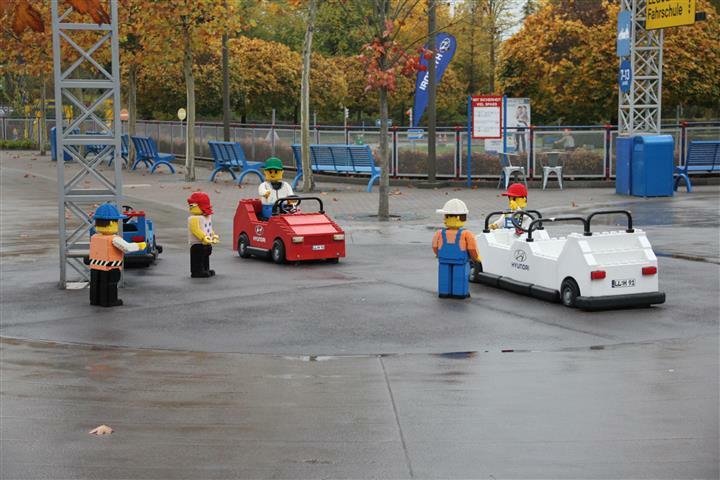 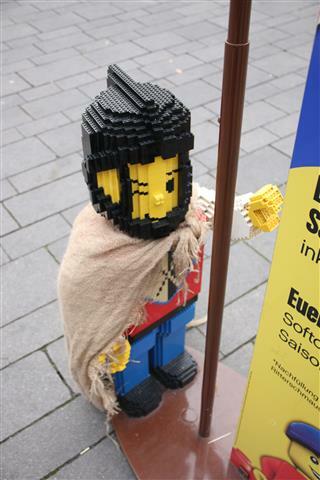 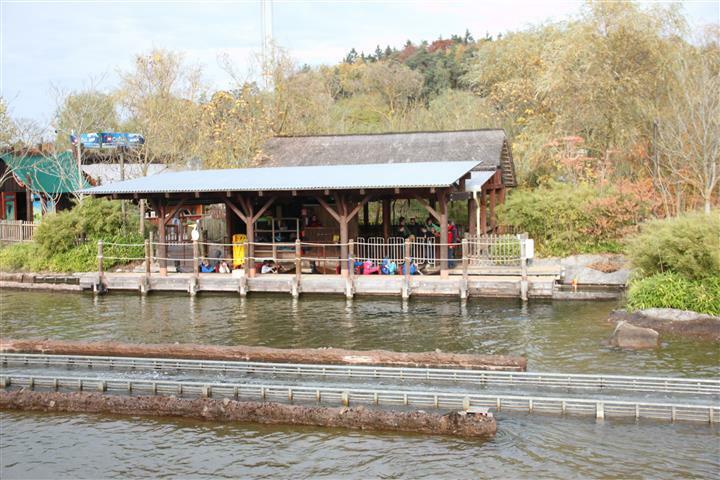 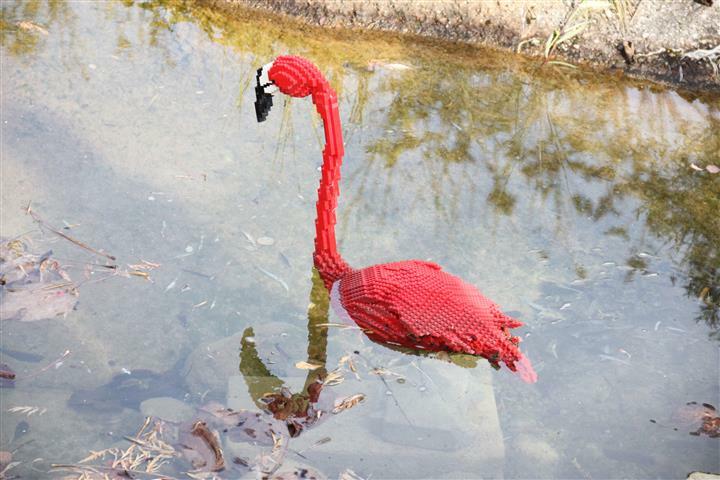 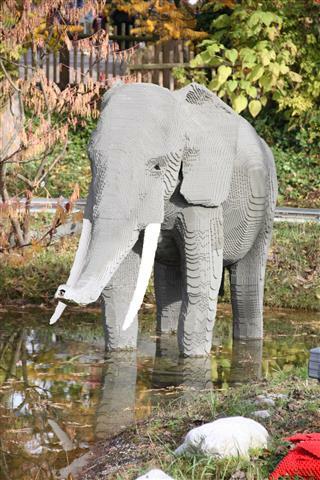 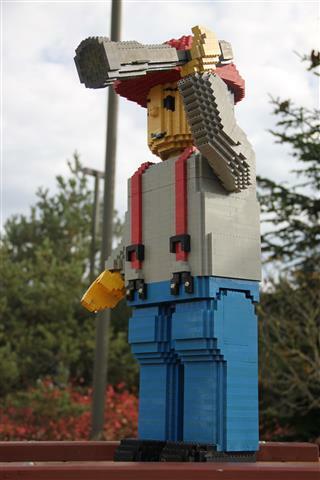 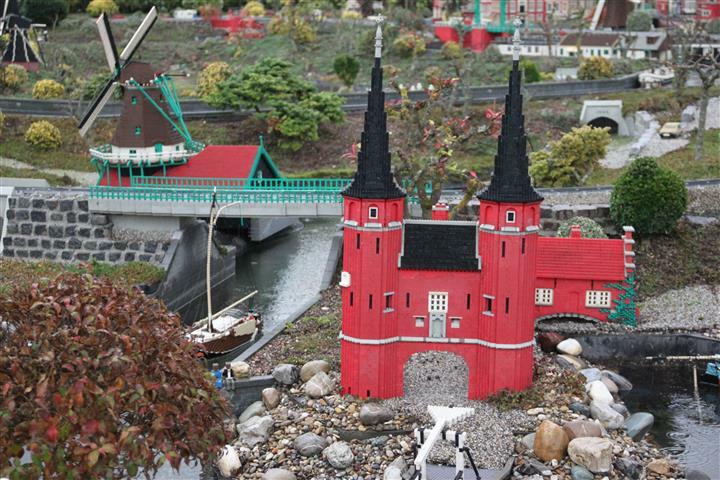 It might have been October of 2013 when we visited Legoland Germany, but we were fortunate because the weather was decently and even unseasonably warm. 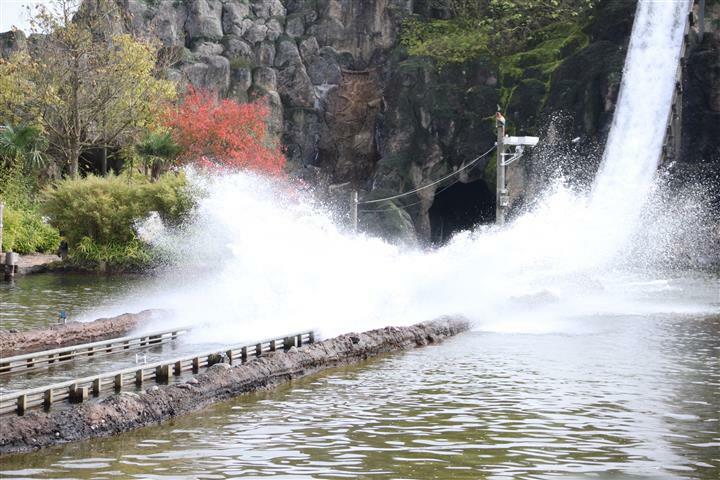 One of the days in particular was over 25 degrees centigrade and sunny, another was 21 degrees but with bursts of intermittent rain. 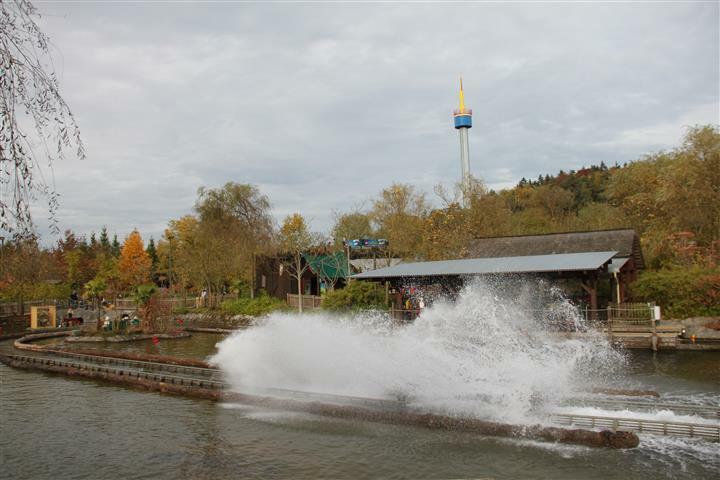 It’s certain that some attractions would be packed full during the hot summer months and one fun way to cool off would be with a good old fashioned water fight. 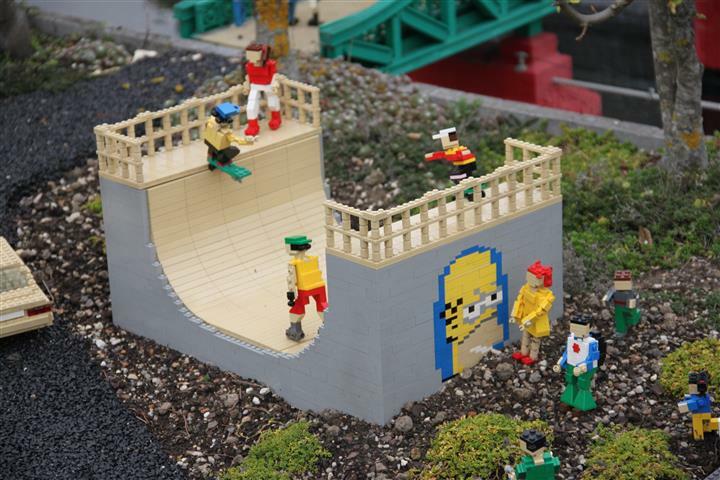 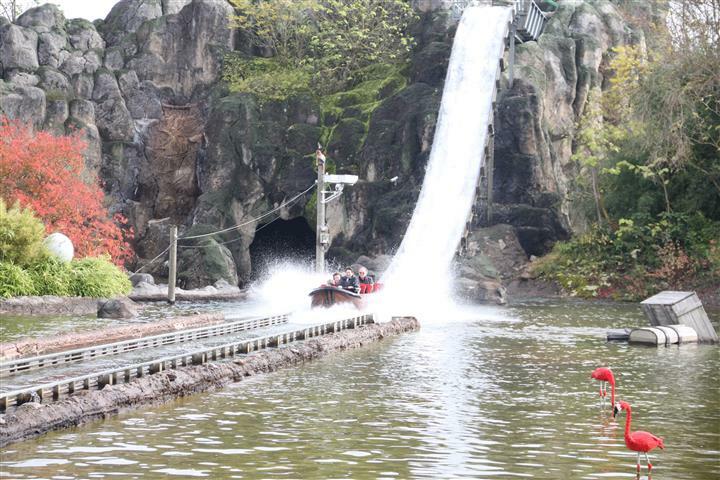 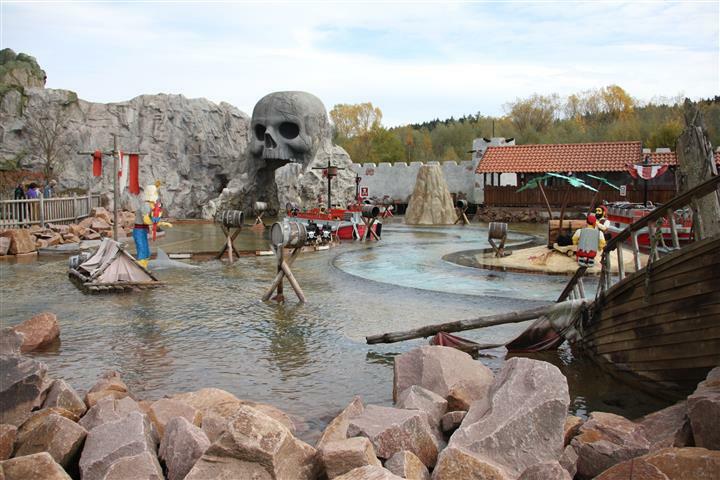 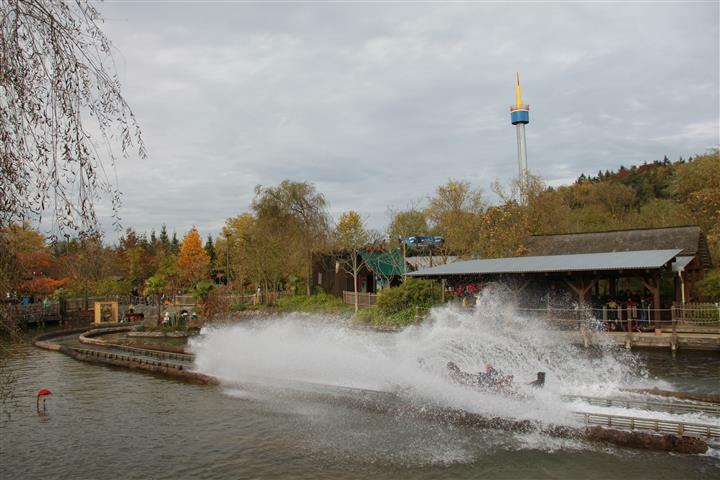 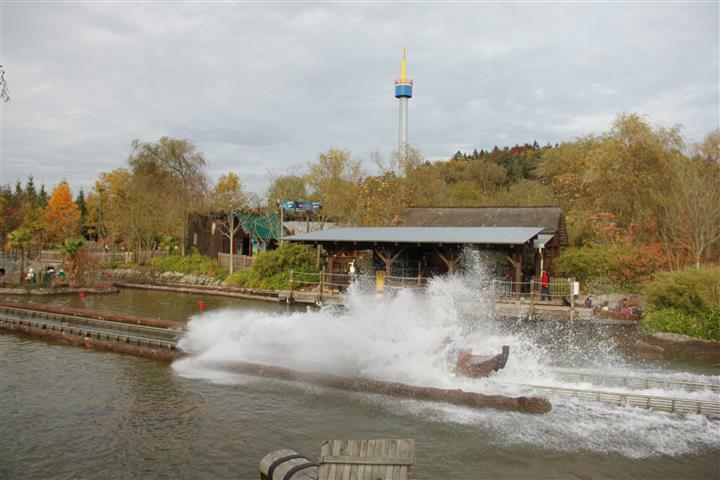 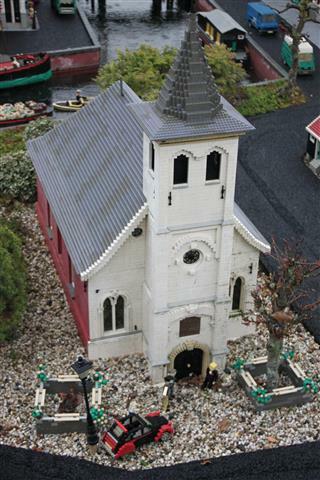 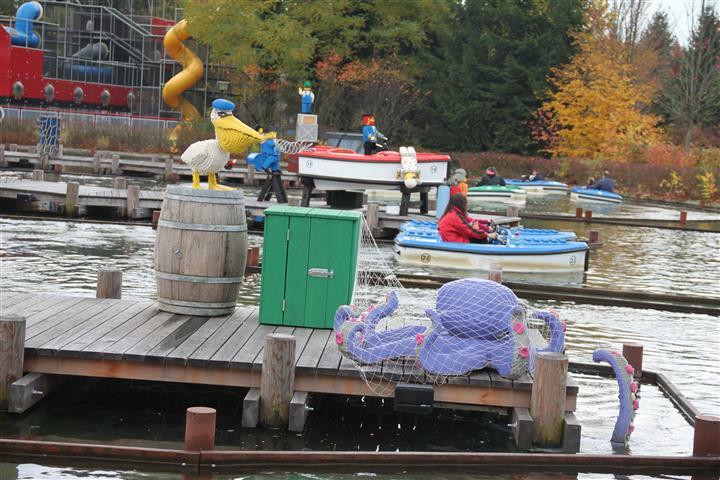 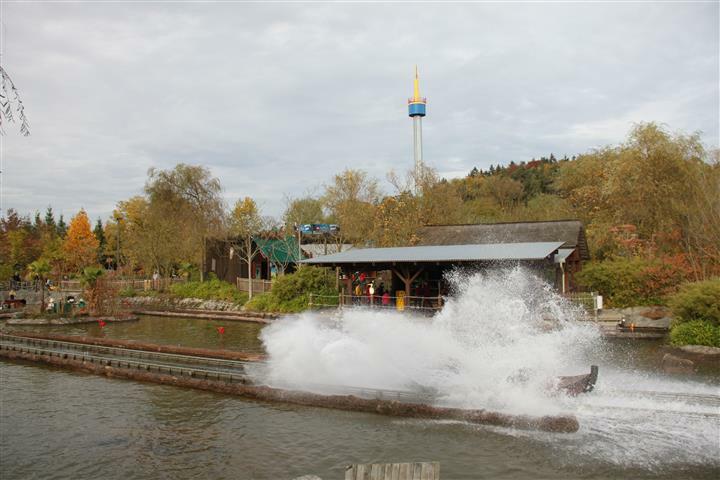 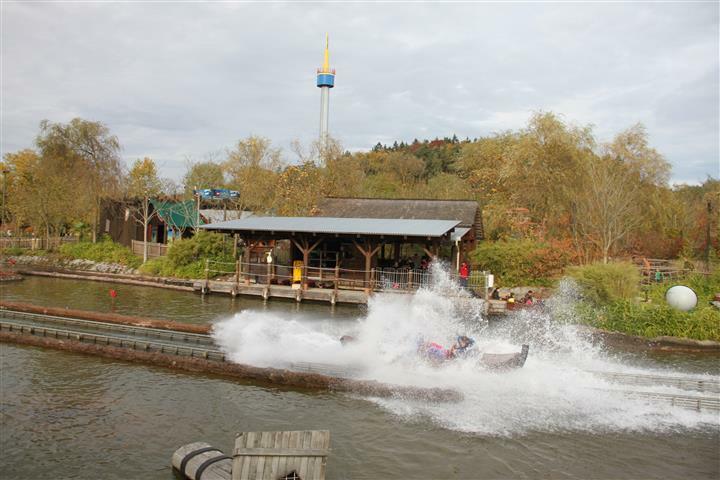 But remember: this is Legoland Germany, so this isn’t just any water fight. 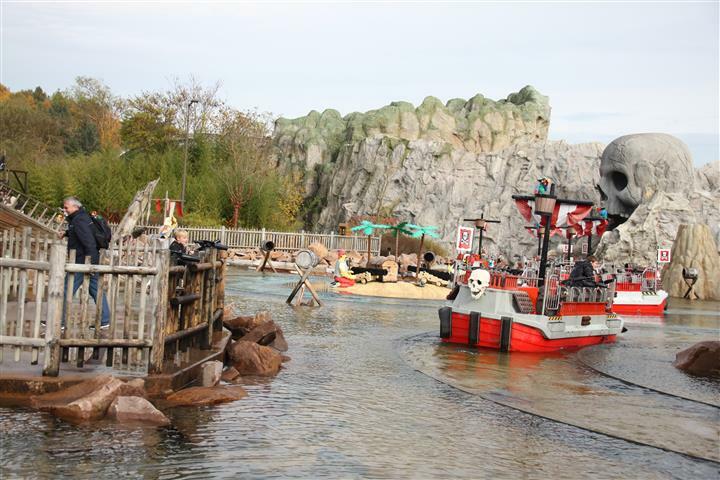 We around yet another corner to discover a pirate themed area, first there is a large pirate playground, then there is the pirate boat ride that Himself and the kids enjoyed a ride on, and then to top it off, there is a large pirate boat ride, where not only can the passengers of the “galleons” work together to wind cranks that pump water cannon onto landlubbers around the attraction, but the landlubbers can go up on a raised platform and onto small jettys where they too can wind cranks and pump water into their water cannons to squirt back. 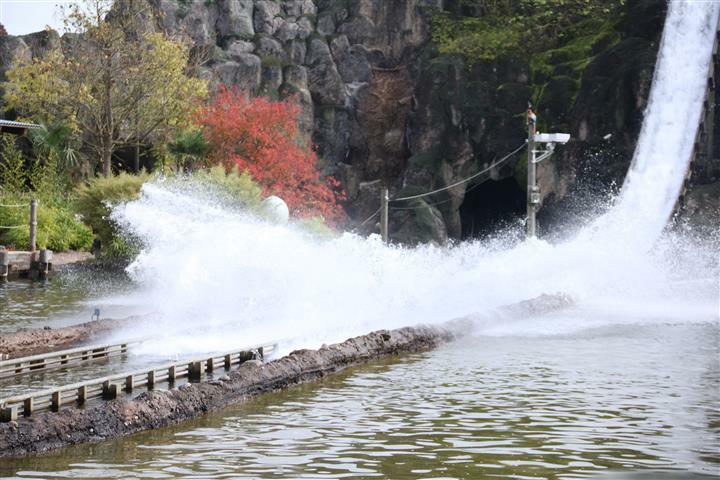 Obviously there are areas to go to if you are keen on joining in the watery fight, and there are dry areas to stand if you just want to watch and enjoy the show. 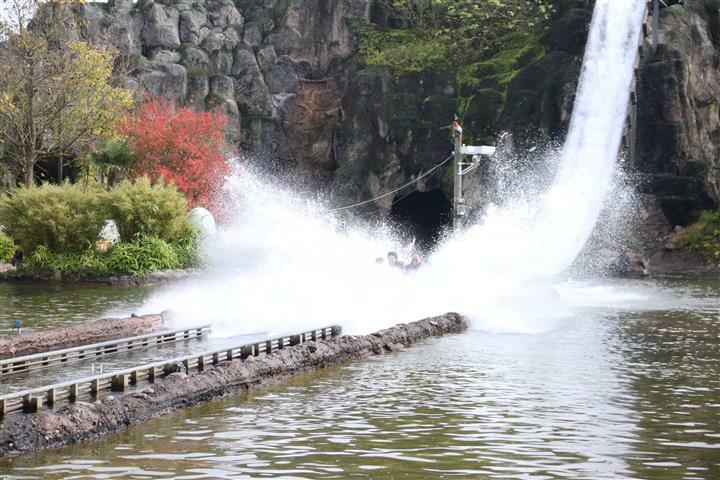 I avoided the slippery boards of the wet jettys and opted for the safety of the dry areas and set to work capturing some of the water fights. 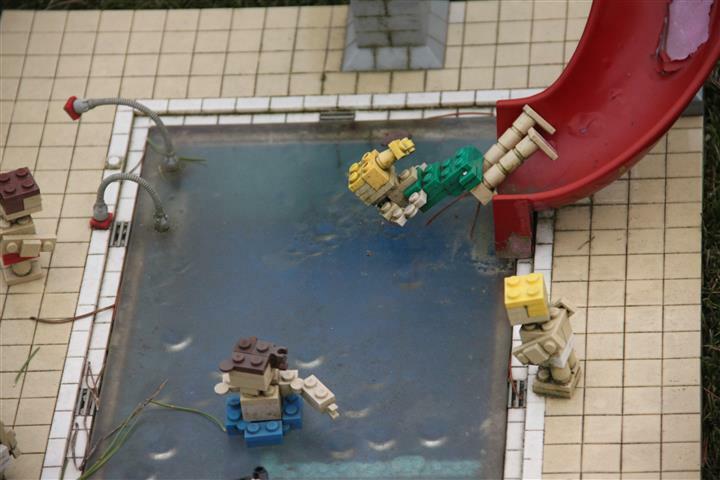 Himself, Little Mr and Kiwi Daughter first took to the landlubber jetty’s and quirted water with great glee at the passing galleons, all the while shrieking with delight as the retaliatory streams of water found their mark, in their faces, down their necks and saturating their clothes. 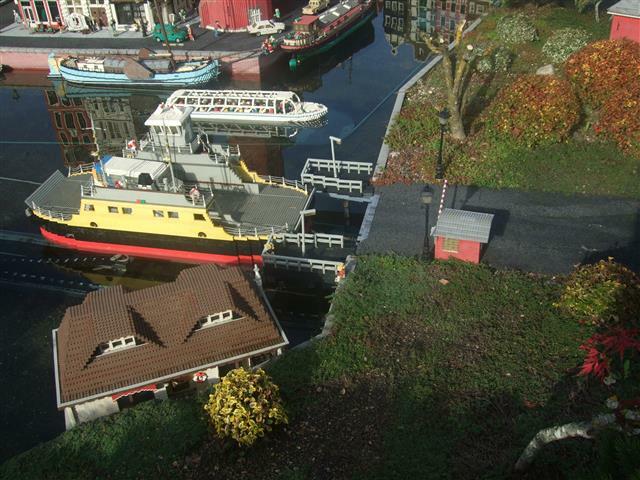 Then they boarded one of the big boats and the roles were reversed, and I got to observe that my husband took considerable enjoyment in manning the pumps with as much effort as possible, to the watery depriment of a father now on one of the jettys with his two sons. 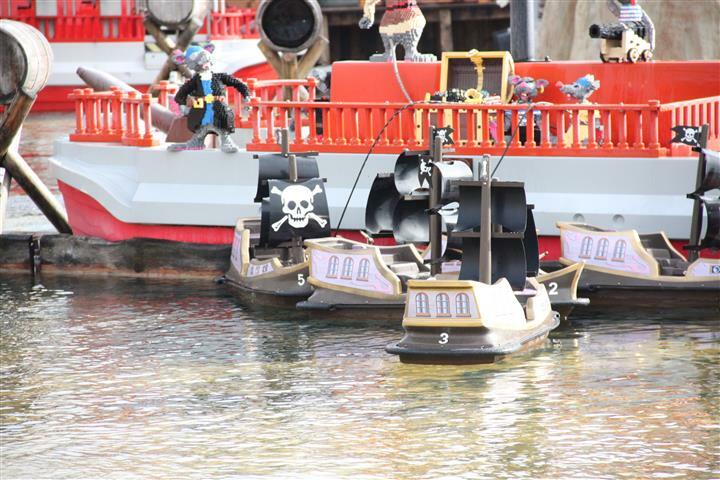 The water barrage got the better of the landlubbers and they were forced to retreat out of range, but the shouts of encouragement and squeals of excitement from both sides showed that much enjoyment was involved in the soaking. 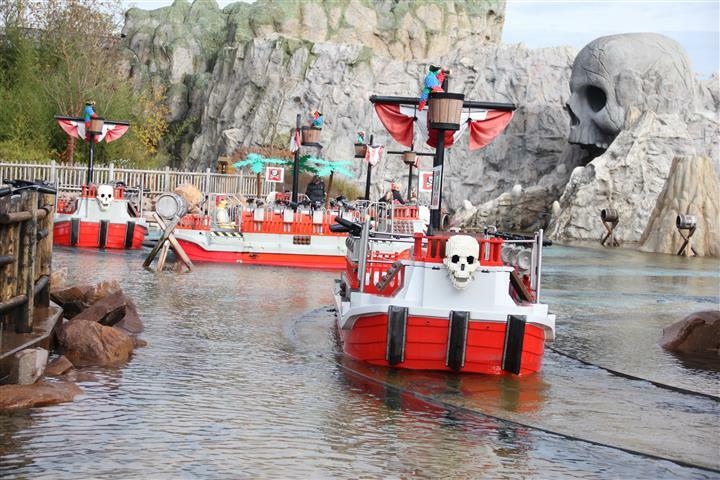 I’m sure that in the height of summer there would be long queues here, since even at this time of year, the whole attraction bought out the inner pirate in young and old. 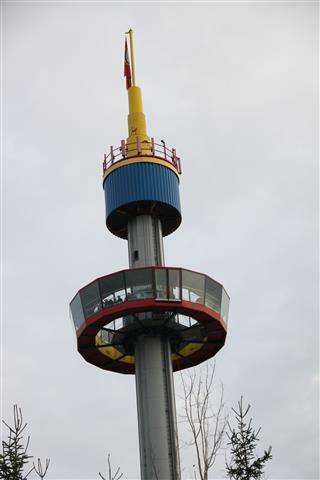 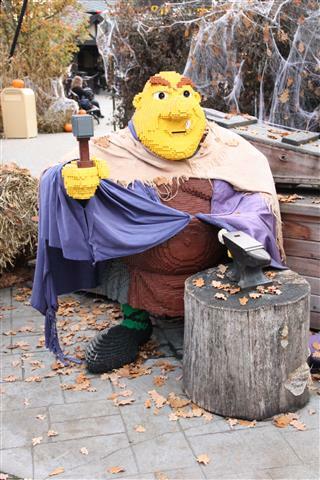 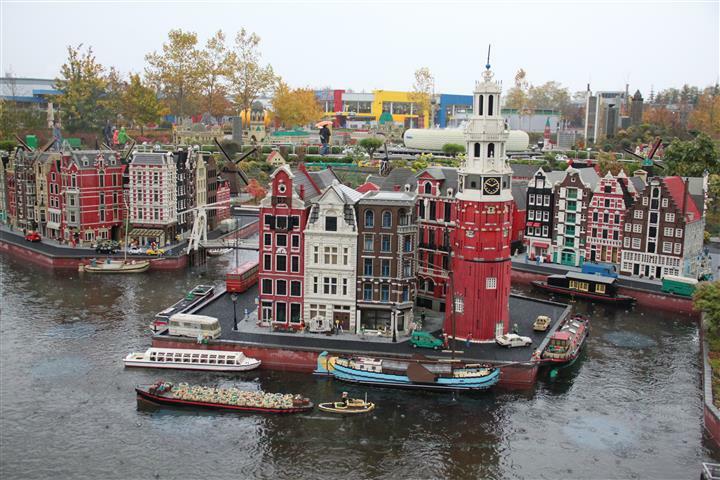 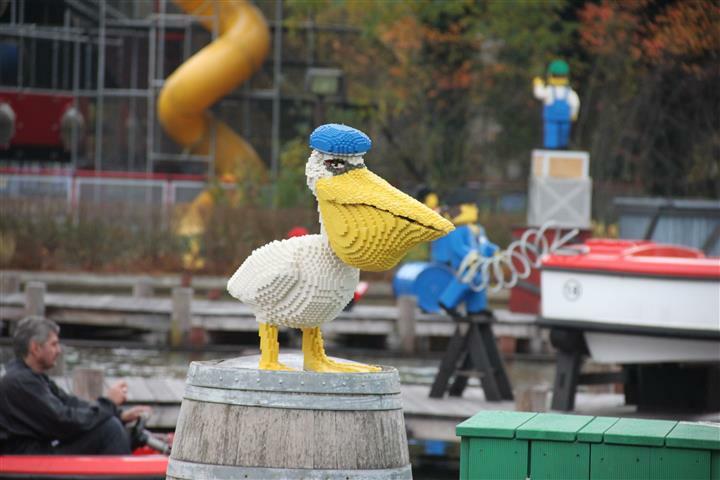 Whilst those who celebrate Christmas are recovering and enjoying a “light” lunch of leftover roast veggies, meat and Christmas Pudding , here is another Kiwidutch retrospective post from our autumn trip to Legoland Germany last year. 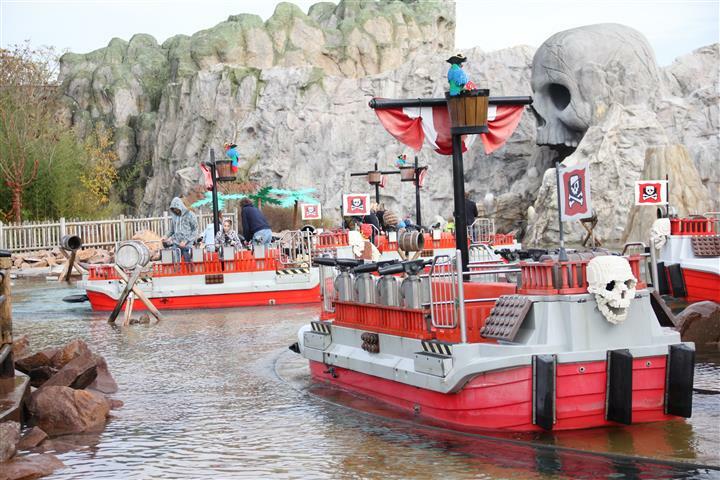 I was surprised to see quite a few rides around the park and in since the place is so enormous, it was day three before we got to this section and discovered more rides to amaze us. 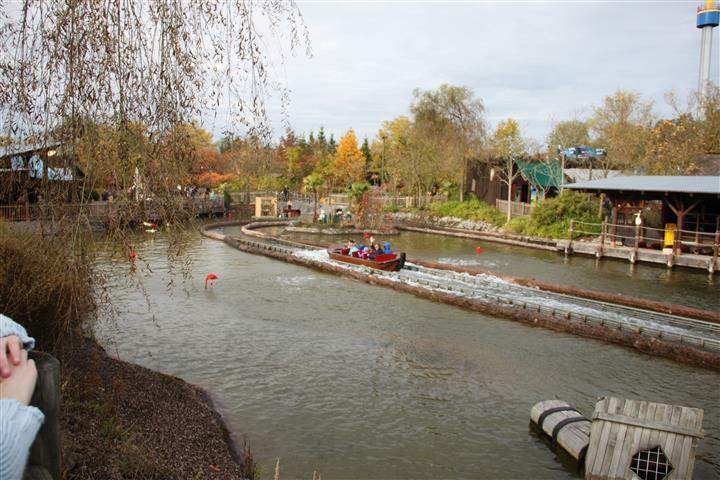 I of course kept well out of trouble and viewed from a distance, Himself and the kids either jumped in excitedly or bailed as the viewings of the attractions progressed. 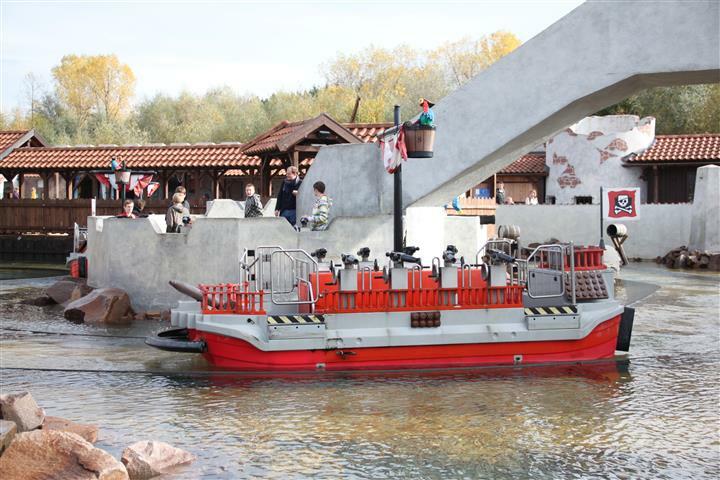 Little Mr for instance, at first sight rather liked the idea of a boat ride, but after seeing that the boat in question takes a big slide down and produces a huge wall of water around it he quickly reversed his decision and frequently repeated the phrase “noooo way!”. 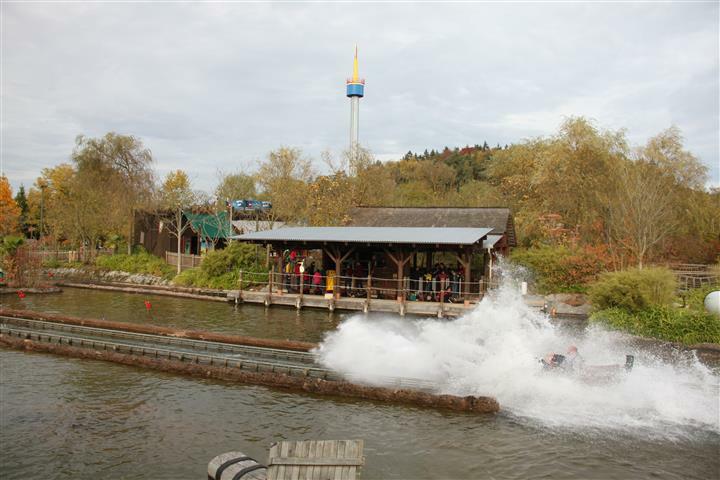 Kiwi Daughter opted out as soon as she saw the drop from the “cliff”, which amused me because on some of the other rides she appeared to enjoy the stomach churning turns. 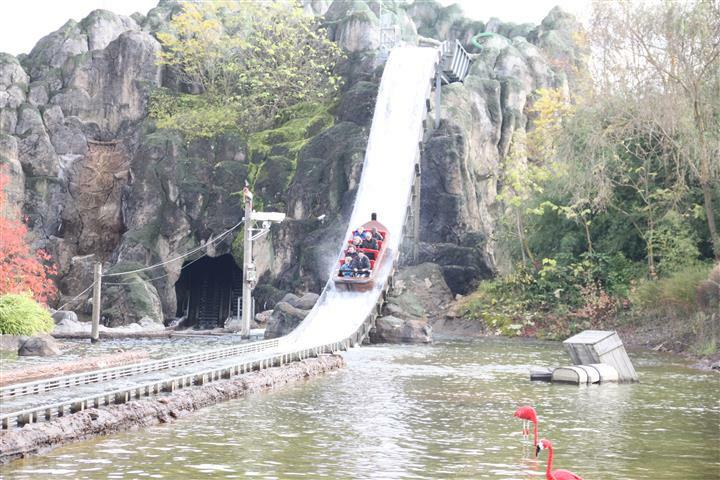 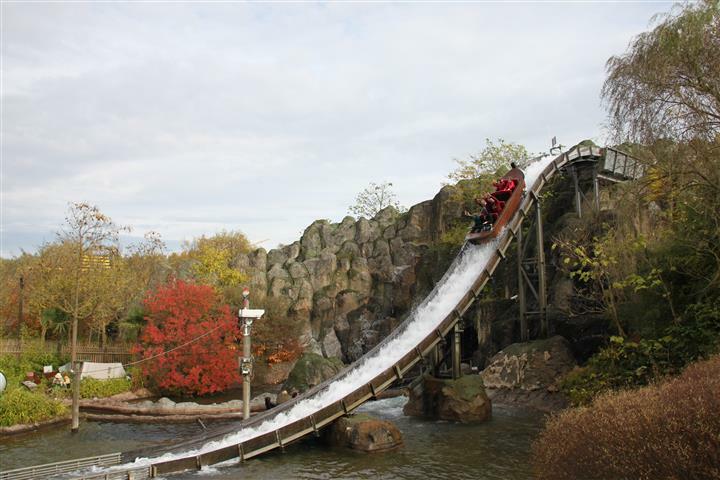 Himself however was not so reticent and declared that this was one ride he really would love to do. 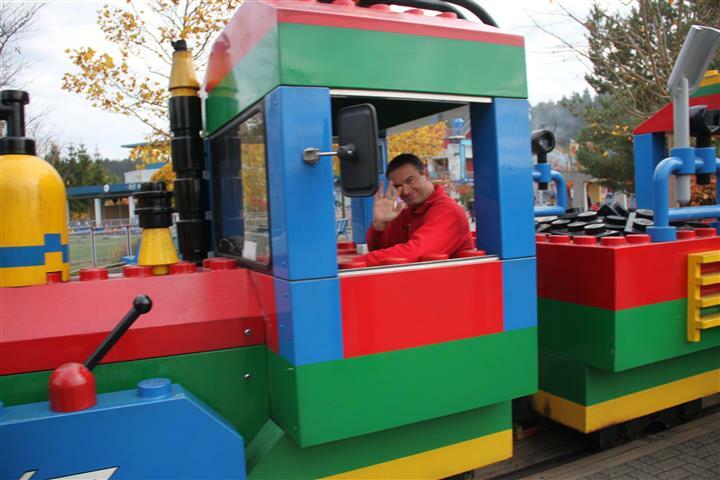 The close-ups of his face as he hurtles towards the bottom of the slide are rather funny, but sadly not for posting due to reasons of internet privacy. 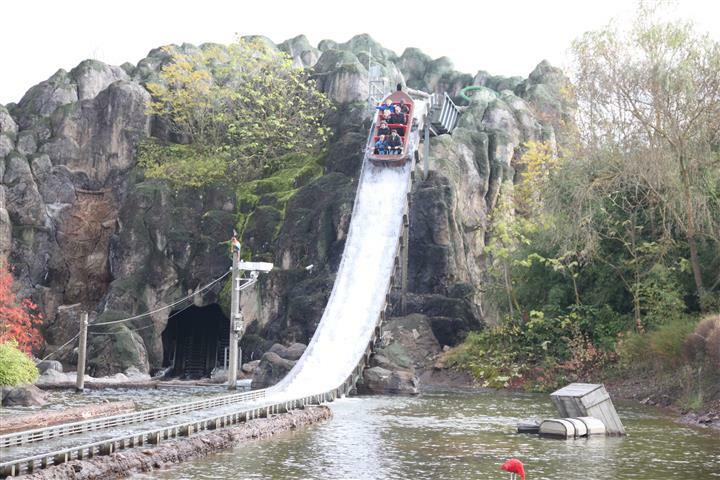 The looks on my children’s faces as they watched their father hurtle towards the bottom of the slide were also rather priceless, so our private family album is richer for the experience. 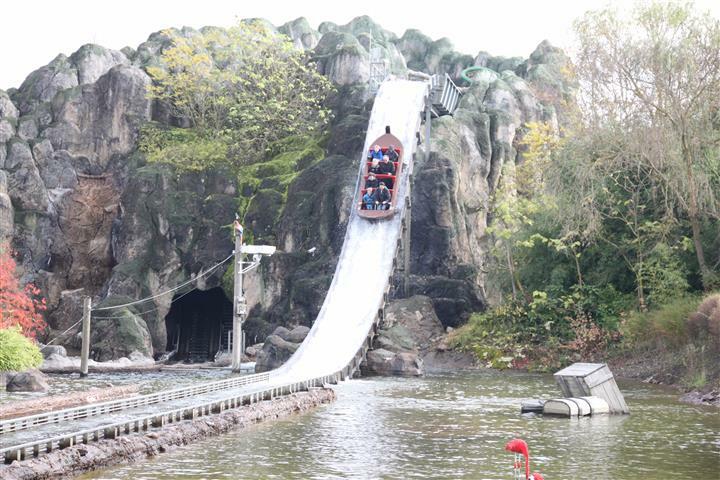 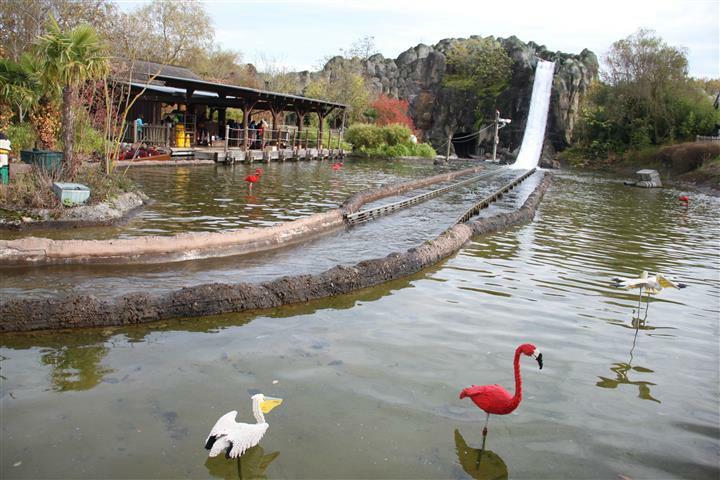 Himself stood in the queue and once his turn to board came around, he waved and he and his boat departed around the back of the “cliff” on which the waterslide stands. 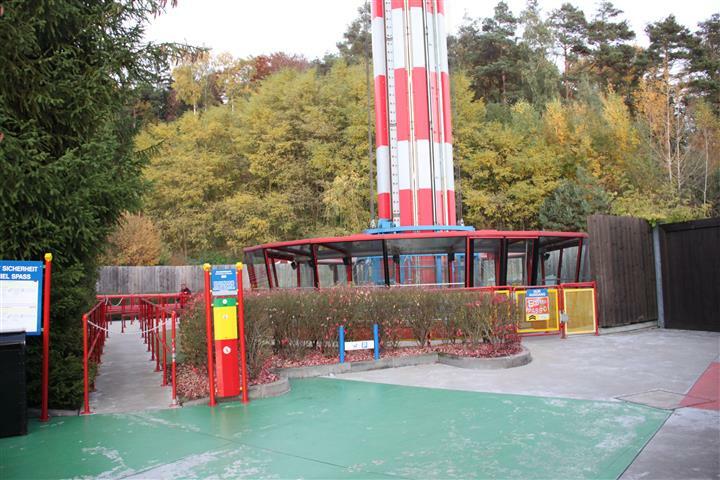 Little did I know, but the ride itself is quite long and very exciting: there are even a few surprises (which I won’t mention here as not to spoil the fun if anyone ends up going on the ride after reading this). 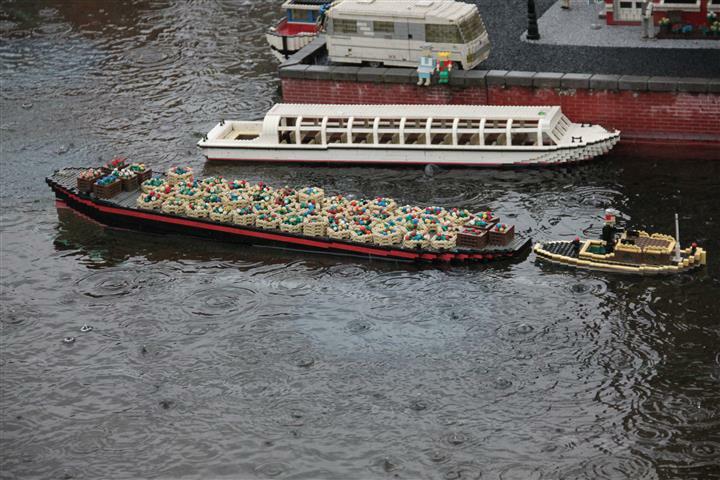 I spent quite a while waiting for Himself’s boat to appear at the top of the “cliff” and used the time to photograph other boats, since the wave made at the bottom is particularly impressive. 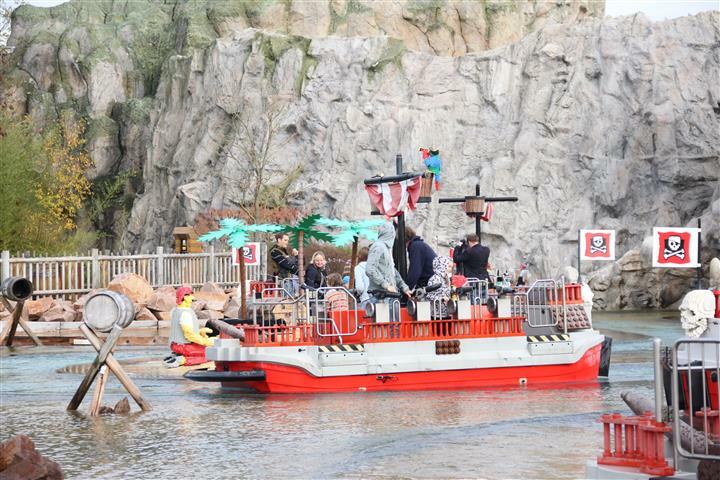 Himself went around several times in all, and loved it… as usual the attention to Lego detail is on hand, Lego flamingo’s, gulls and pelicans don’t at all mind getting wet by this ride. 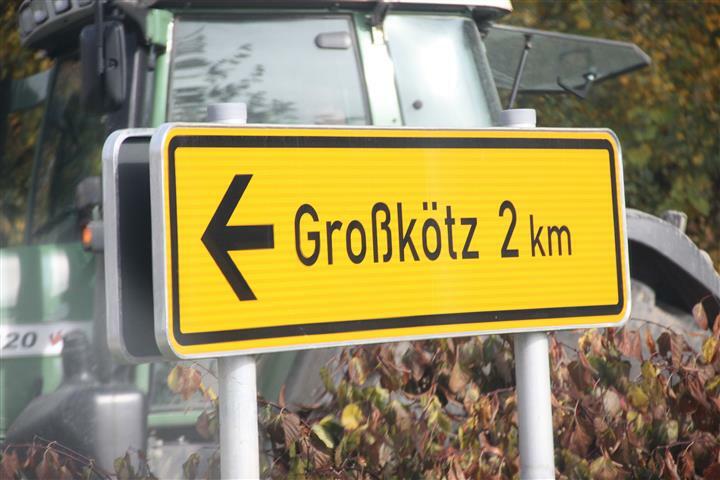 Informational signs in other languages have long been sources of mirth for travellers, if the word or words in question translate badly into a language you are familiar with. 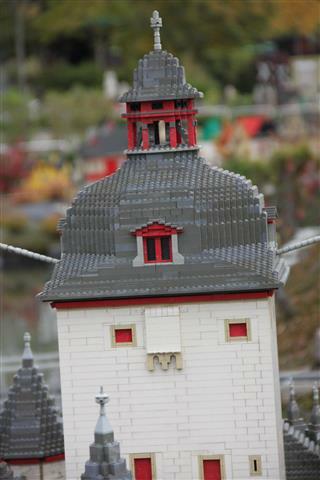 As illustrated in the last photograph in this post: So, Which Part of France are we in Anyway? 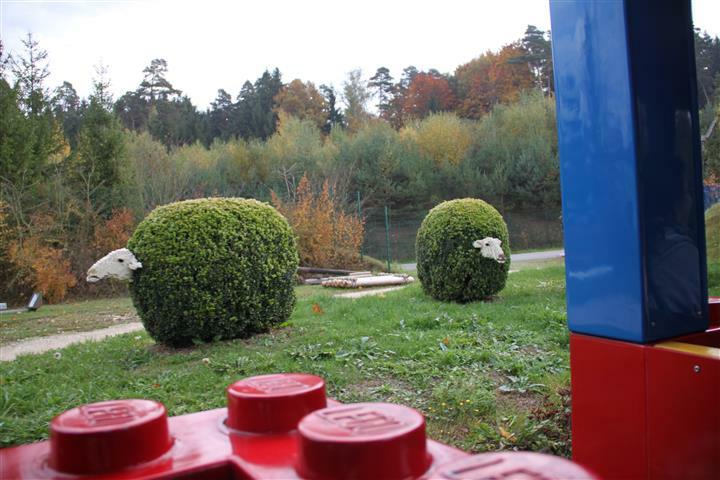 it’s easy to be selective about how you translate what you see. 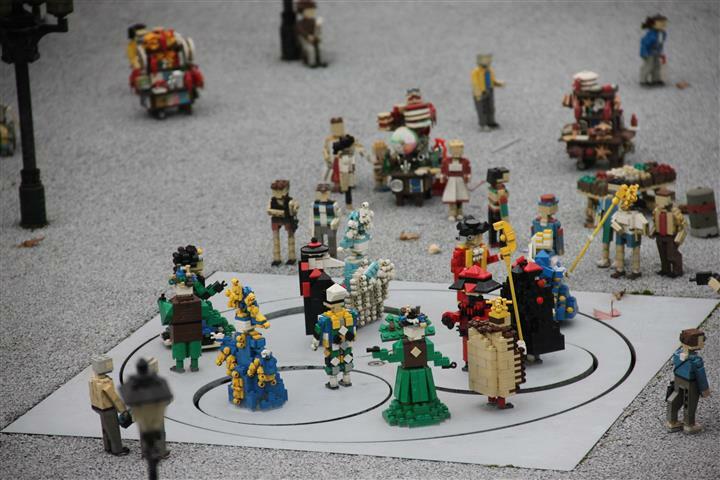 The mind of course plays tricks because you see what you think you recognise and not what’s actually there as the locals see it. 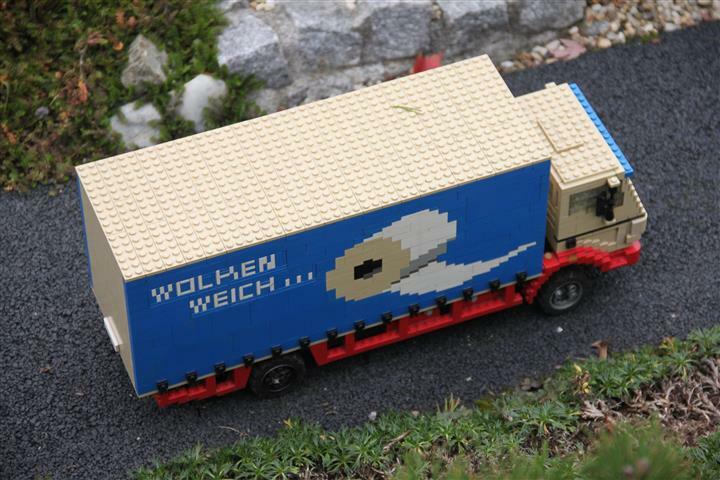 In our bilingual family this happens rather a lot. 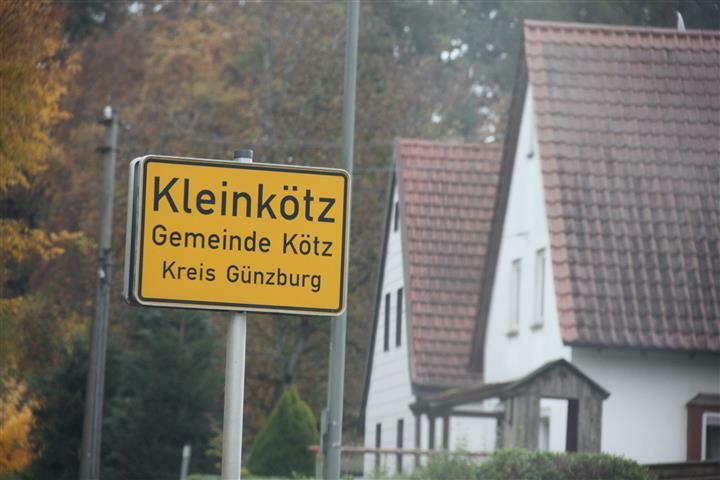 Between our hotel in the village of Ichenhausen and the Legoland Germany theme park there are three villages that we drive through and they had us laughing out loud the first moment their place name boards came into view. 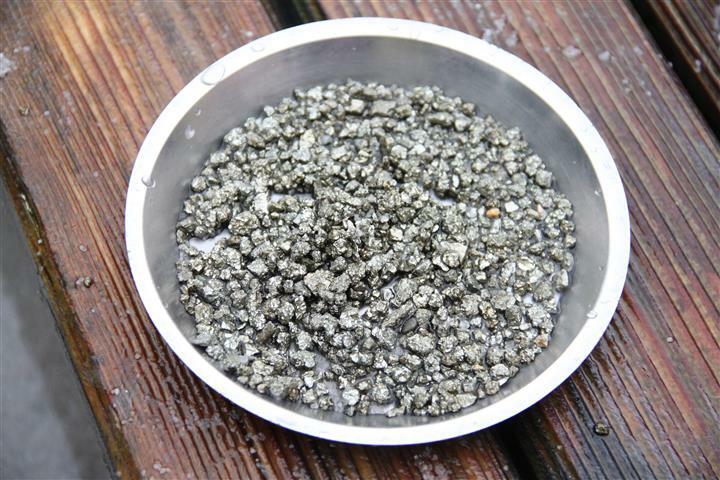 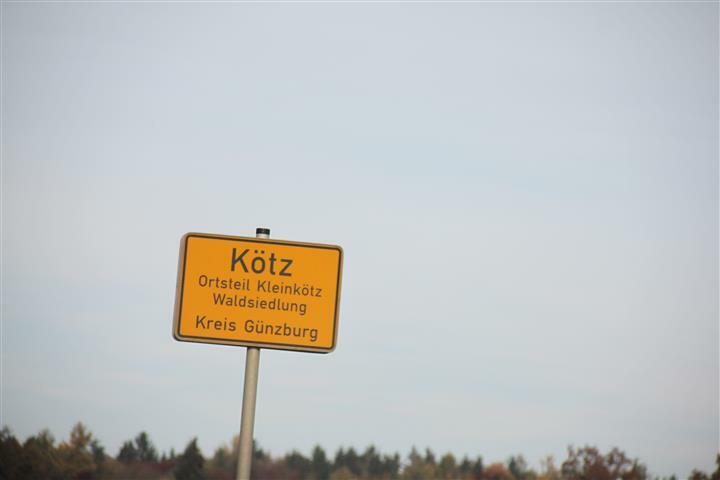 It’s a sad coincidence that the very innocent German word “kötz” bears an uncanny resemblance to the Dutch word for “vomit / up chuck etc” so you can imagine the jokes and puns that “erupted” when we passed through “Kötz” (vomit), “Kleinkötz” (little vomit) and “Groβkötz” (big vomit). 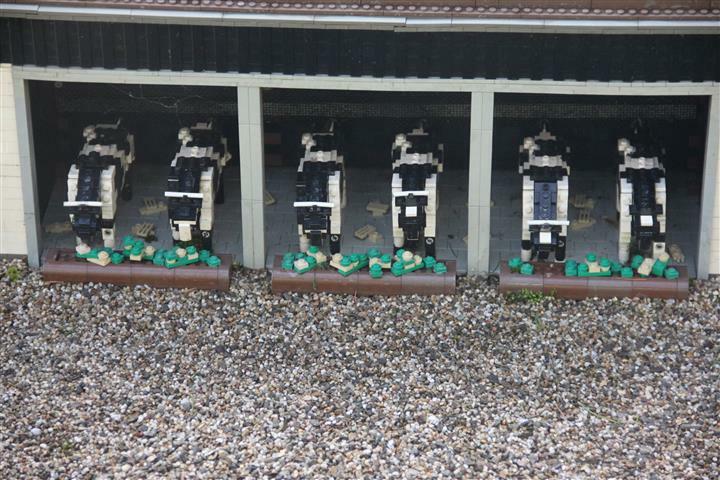 Are they sick of the sight of each other? 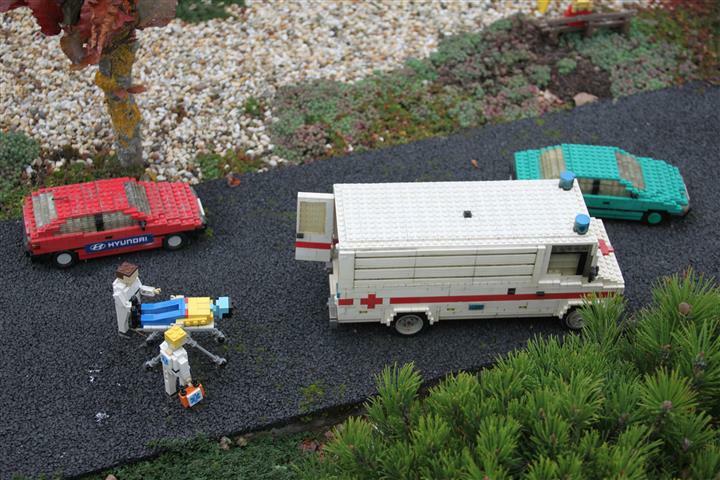 …together in sickness and in health? 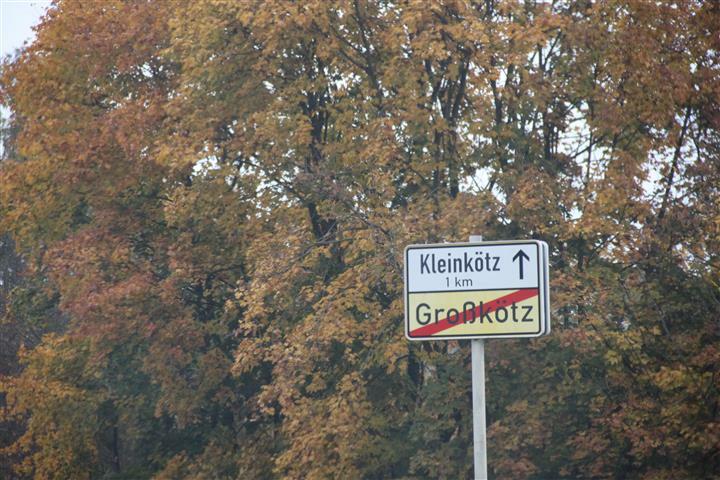 … clearly Kleinkötz got thrown up on the outskirts of Groβkötz … it’s a very “green” area of the country…. 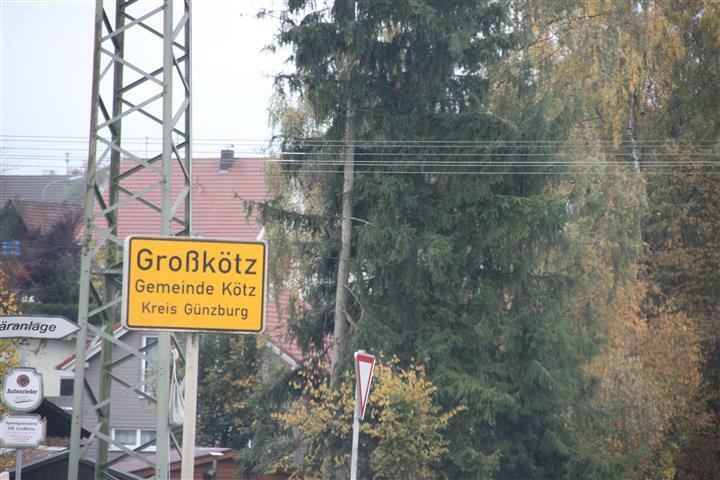 if you live in Groβkötz and you are only feeling a tiny bit ill should you have the move house further down the road ? 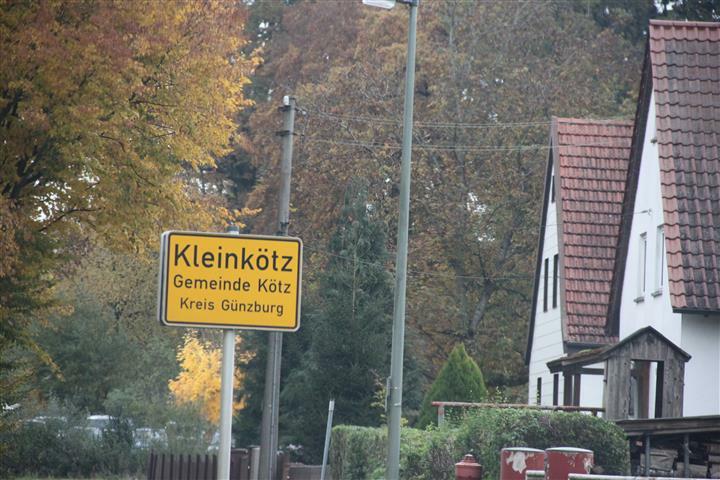 (or visa versa if you are really ill) … it’s an agricultural area, so is there maybe a seed company in one of these towns called “Seedy”? 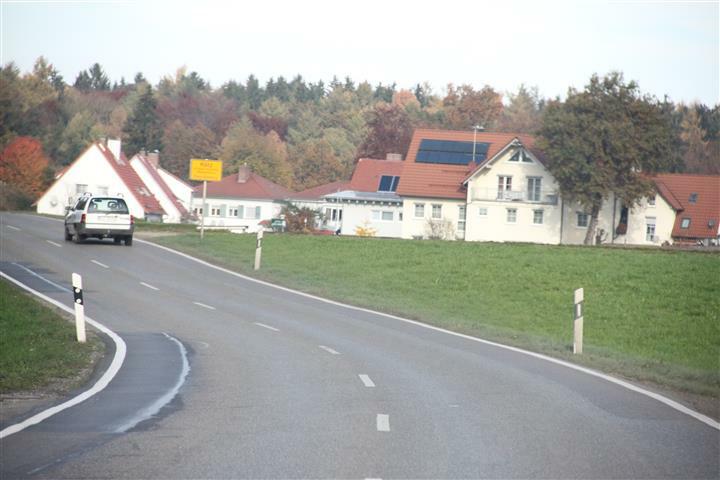 …probably neither of these villages were planned: they were thrown up here… urban sprawl spews everywhere these days… if you leave town does this mean you are feeling better again? 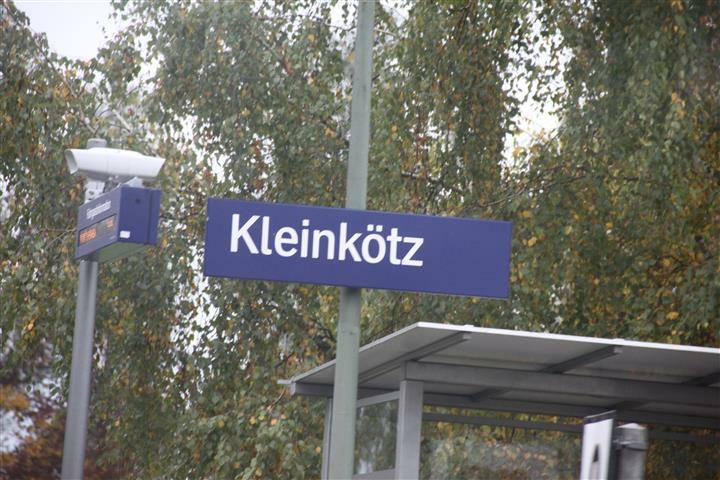 …seriously, are these names someone’s idea of a sick joke? 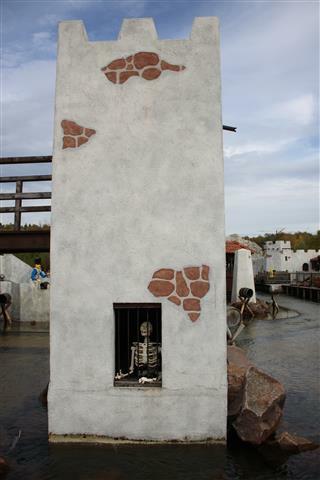 … or just a little “ill” advised?